The security fencing has just been installed and the ground preparation has begun. 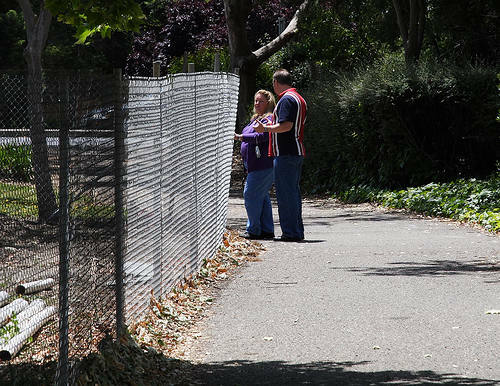 Fencing donated by Thompson & Thompson Fence Company, San Lorenzo, CA. Week of 18 June 2006. 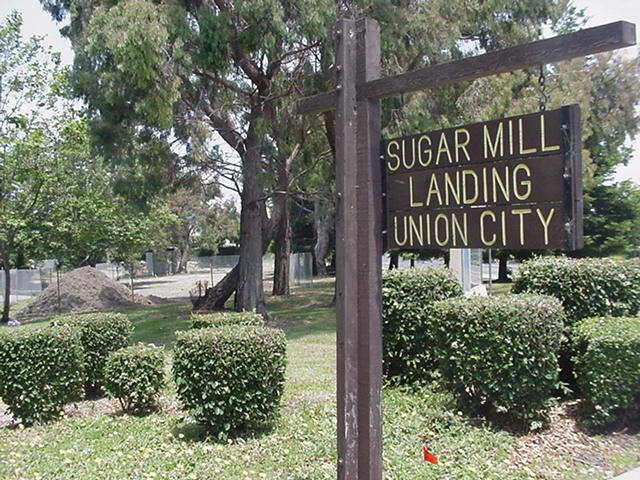 A South view of the Sugar Mill Landing Park sign and the security fencing which has just been installed and the ground preparation has begun. 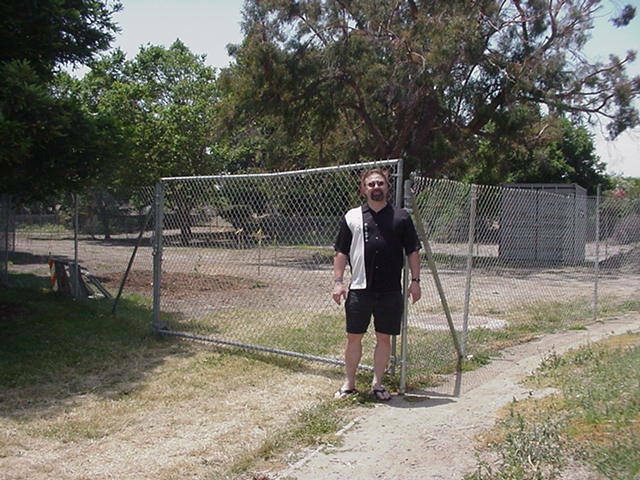 Memorial Originator and Project Manager Michael L. Emerson and a NorthEast view of the security fencing which has just been installed and the ground preparation has begun. 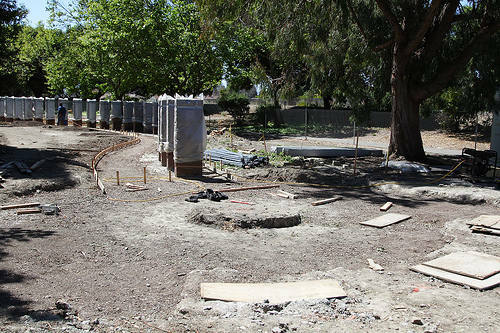 SouthEast corner view of the security fencing which has just been installed and the ground preparation which has just begun. Iron Workers from Iron Workers Local Unions #377 & #378 working on the Flight 93 Memorial. 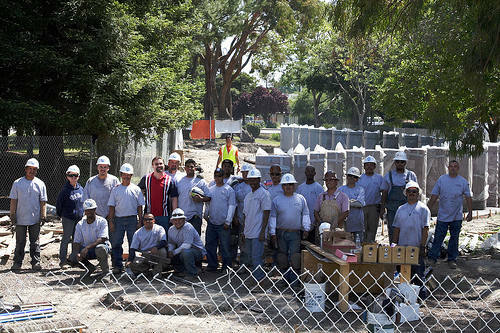 The workers are Jason Gallia, Jamie M. Fernandez, Ramon Munoz D., Dante Lopez, Rafael M.R., and Gerardo Rodriguez. Week of 25 June 2006. Union Carpenter volunteers from Carpenters Local #713 working on the Flight 93 Memorial. Week of 2 July 2006. The concrete Remembrance Stone boxes for the Flight 93 Memorial. Union Carpenters from Carpenters Local #713 volunteers working on the Flight 93 Memorial. Preparing to install the concrete Remembrance Stone boxes for the Flight 93 Memorial. Week of 9 July 2006. Union Carpenters working on the Flight 93 Memorial doing some of the framing for the concrete pour. Union Carpenter volunteers working on the Flight 93 Memorial installing the framing "block outs" that the Remembrance Stones will be put into after the concrete pour. 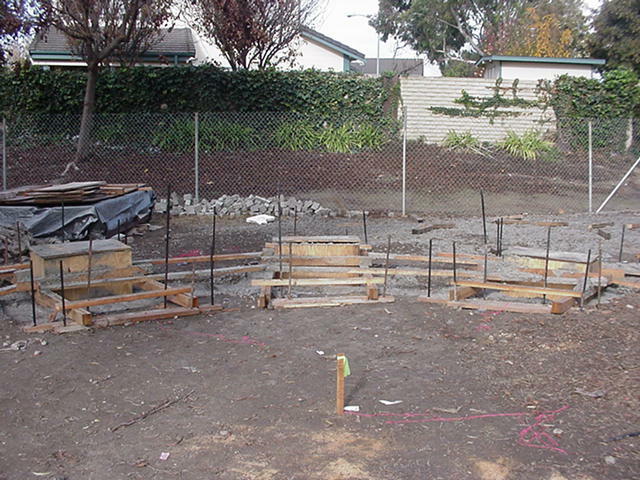 A picture of the framing and "block outs" that the Remembrance Stones will be put into after the concrete pour. 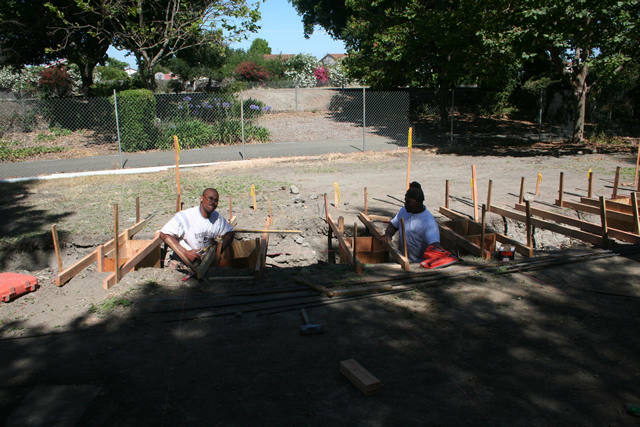 This excellent work was donated by Alameda County Union volunteers. Roland Pasibe & Tim Howard the owner of Prismatic Instant Sign Center, Milpitas, CA and the Memorial Site Banner that Tim donated for the Memorial. Week of 23 July 2006. Michael L. Emerson the Memorial Originator & Tim Howard the owner of Prismatic Instant Sign Center. Amanda Ray (of Prismatic) and Michael did the design of the Memorial Site Banner. 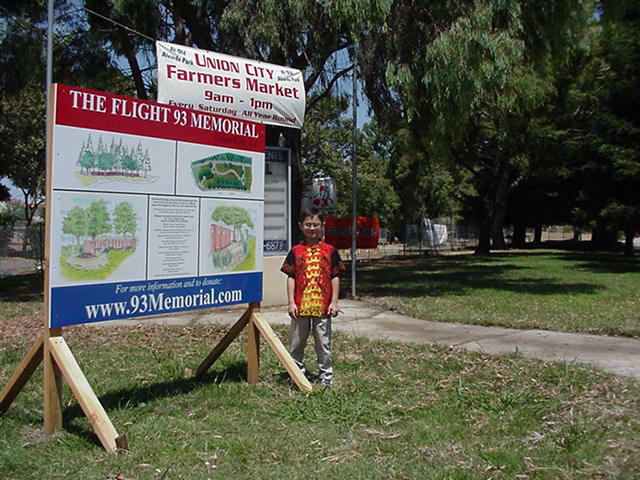 Michael L. Emerson's oldest son Nickolas and the new Site Banner with the Flight 93 Memorial site in the background. Week of 6 August 2006. 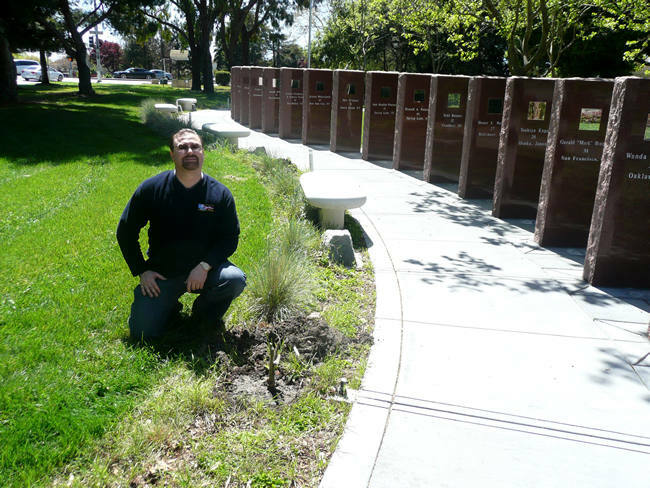 The two cut, polished, and engraved Story Boards already at the Memorial site in Union City, CA They are ready to be installed in the Memorial's Plaza of Remembrance. We are waiting for third stone which is the final Donor/Sponsor Board so we can install all of them at the same time. Week of 1 April 2007. 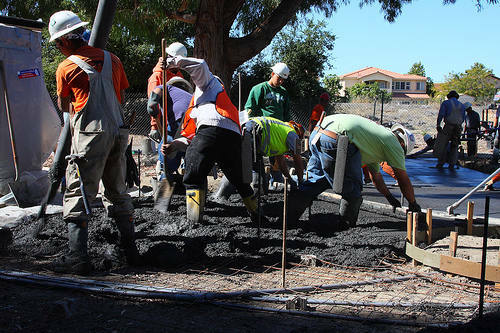 Laborers from Laborers Local #304, Carpenters and Iron Workers putting in the "first pour" of the concrete that was donated by Central Concrete Supply Company of San Jose, CA. Week of 30 July 2006. 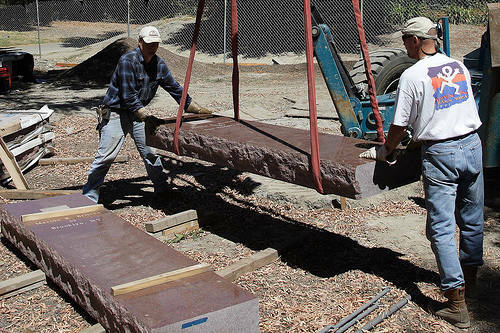 Concrete during the process of pouring it into the stone trench around the "block outs" for the Memorial Stones. 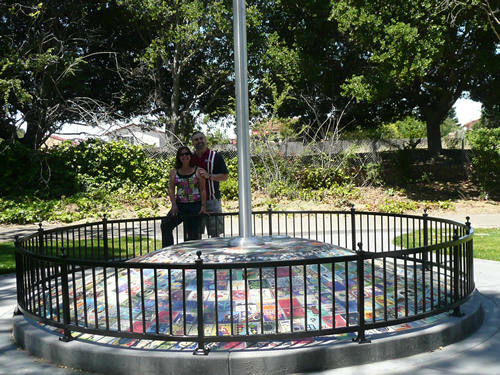 Alameda County Trade Union Volunteers donated the labor to install it. 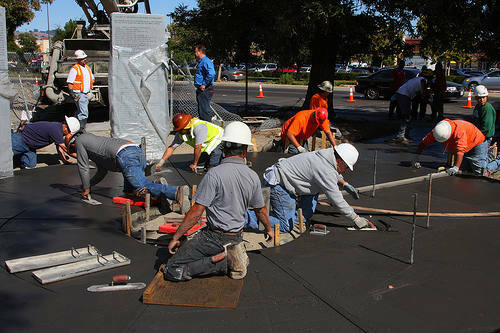 Laborers, Carpenters and Iron worker volunteers putting in the "first pour" of the concrete, the concrete pumping was donated by Landavazo Brothers Cement Company, Hayward, CA. 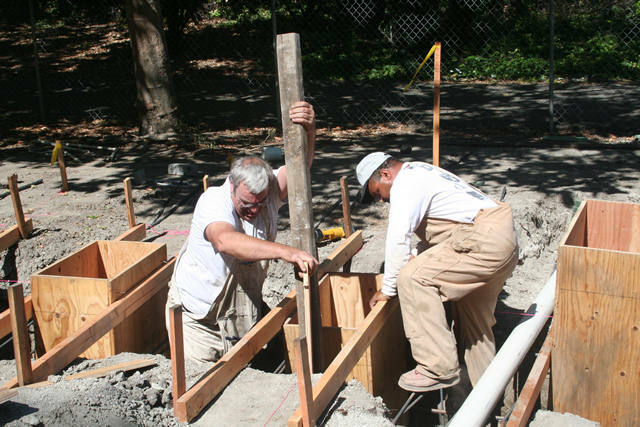 Laborers from Laborers Local #304, Carpenters and Iron Workers installing the concrete in the Memorial Stones trench. 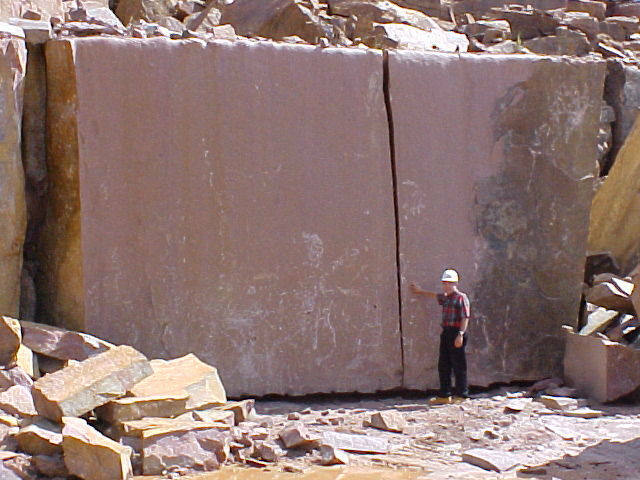 Picture of Mr. Moe Bohrer of Anderson Brothers & Johnson/Michels Corp. in Brownsville, Wisconsin and some of the large granite blocks of "Wausau Red" granite which is being used to make the Flight 93 Memorial's Remembrance Stones. The stone is being sent to Boyd Granite in Elberton, Georgia for cutting, polishing and engraving. Week of 20 Aug 2006. 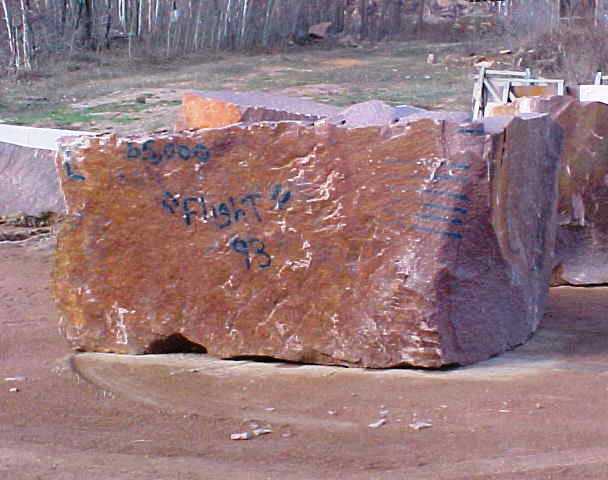 Picture of one of the large granite blocks of "Wausau Red" granite which will be used to make the Flight 93 Memorial's Remembrance Stones. They have been donated by Anderson Brothers & Johnson/Michels Corp. in Brownsville, Wisconsin. The stone is being sent to Boyd Granite in Elberton, Georgia for cutting, polishing and engraving. 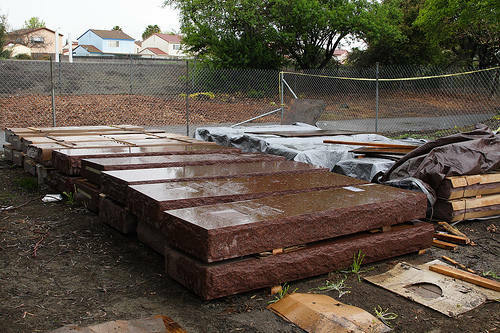 Large granite blocks of "Wausau Red" granite which will be used to make the Flight 93 Memorial's Remembrance Stones being loaded onto a flatbed truck for shipping. 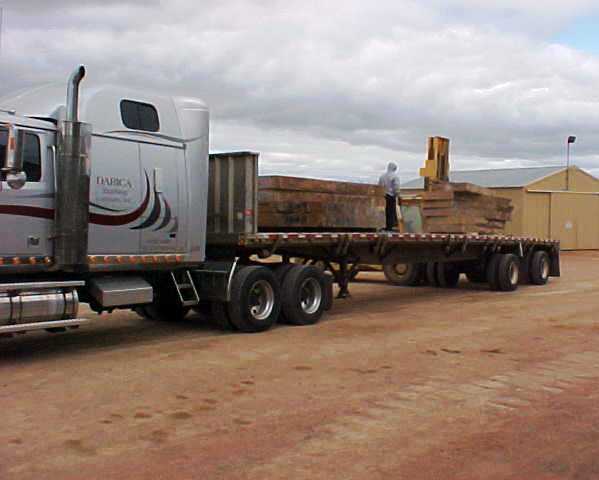 The delivery of the stones from Wisconsin to Georgia is donated by Darica Trucking Company of Elberton, Georgia. The stone is being sent to Boyd Granite in Elberton, Georgia for cutting, polishing and engraving. 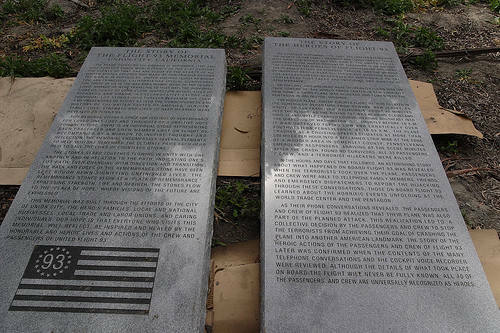 The two cut, polished, and engraved completed story boards for the Memorial ready to be shipped from Elberton, GA to Union City, CA and installed at the Memorial. 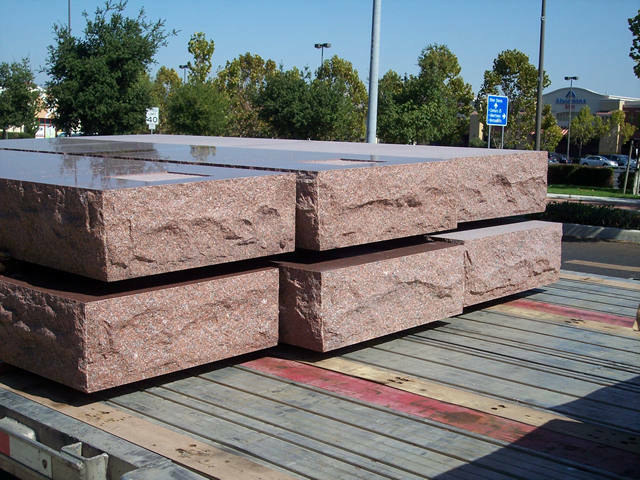 Each stone is made of solid Robin Blue granite from the Boyd Granite Company, Elberton, GA they are each 3,000 lb, 10ft tall (3ft 6in goes into the ground), 30 inches wide and 8 inches thick. The ATS truck driver and other Flight 93 Memorial volunteers helping with the first delivery of 20 of the Remembrance stones and the 2 Story board stones. 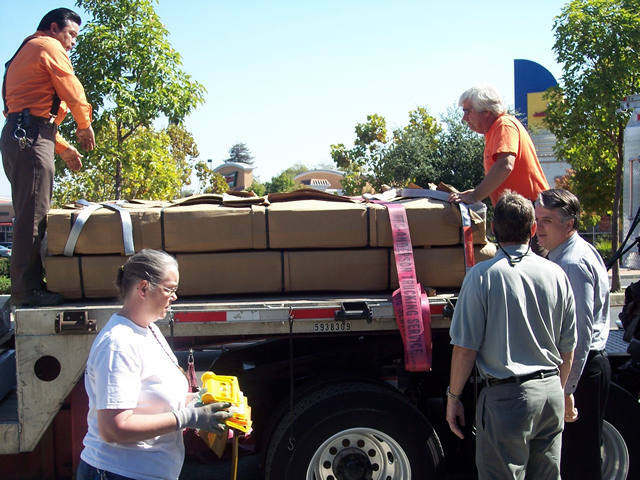 The delivery was donated by Anderson Trucking Services, Inc. of St. Cloud, Minnesota. Week of 8 Oct 2006. 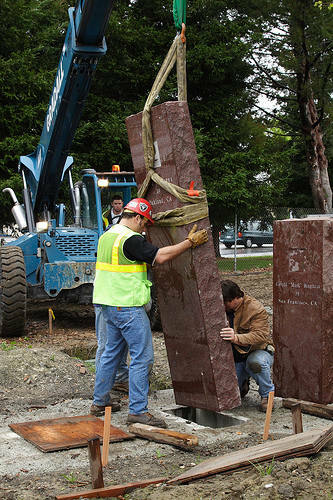 Union City Staff, the ATS truck driver, and other Flight 93 Memorial volunteers helping with the down loading of the first delivery of 20 of the Remembrance stones and the 2 Story board stones. 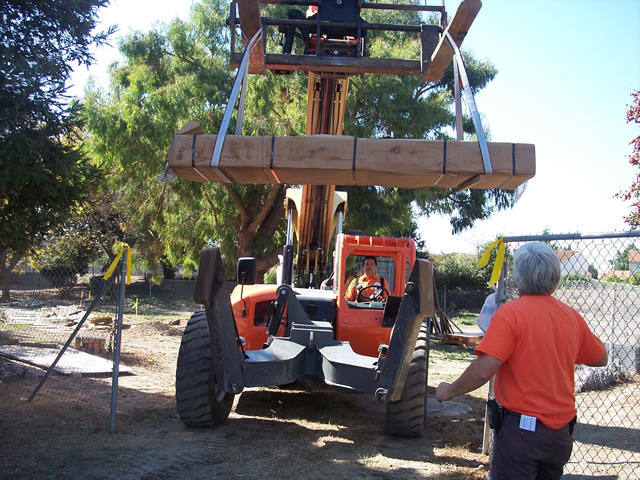 Union City Staff and Flight 93 Memorial volunteers moving one of the Remembrance stones by crane from the truck into the Memorial park area. The stones are still wrapped in plastic and cardboard for their protection during the long trip from Elberton, Georgia. 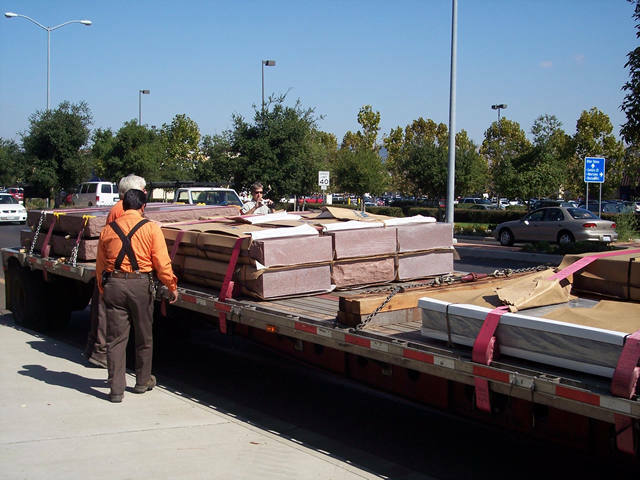 A view of some of the Flight 93 Memorial's Remembrance stones being delivered to the Memorial site. 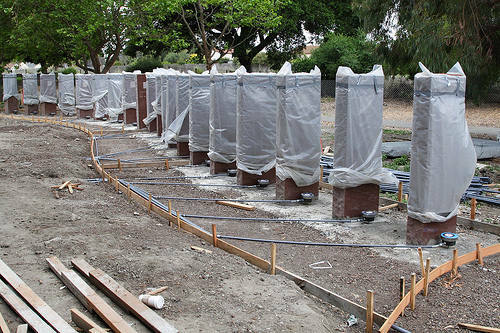 The stones still need to be installed into their individual concrete platform. 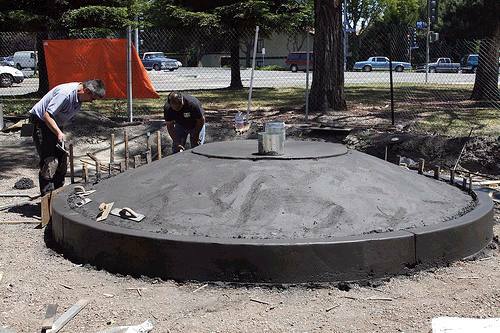 Once installed they will be coated with a special DuPont color enhancer and sealer/protector donated by Stonetech Professional, Inc. of Walnut Creek, California. The labor to spray it on is being donated by Paul Beaton of Cleaner One, Inc. of San Ramon, California. Anderson Trucking Services, Inc. of St. Cloud, Minnesota making their second large delivery donation of the Memorial stones to the Flight 93 Memorial site. Week of 15 Oct 2006. A Memorial volunteer unloading the Memorial stones from the ATS truck for the Flight 93 Memorial. 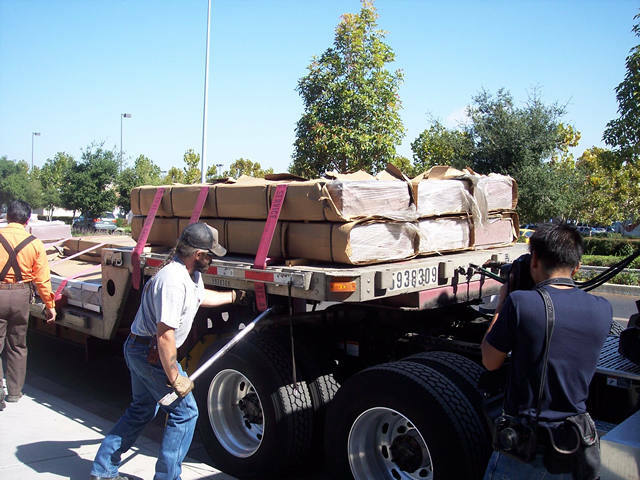 A view of some of the Flight 93 Memorial's Remembrance stones being delivered to the Memorial site. 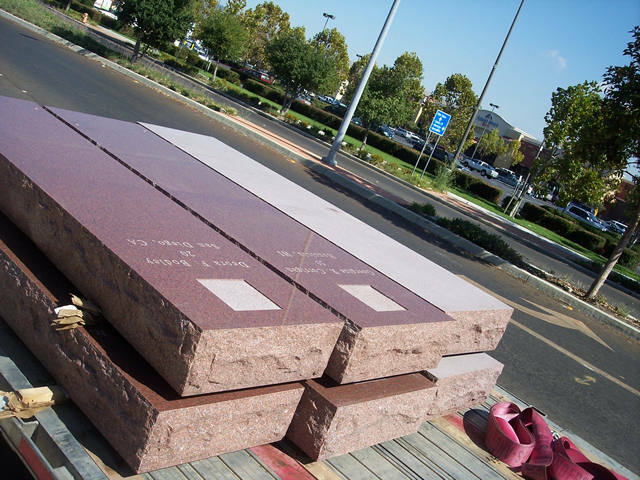 The stones are made of "Wausau Red" granite and have been donated by Anderson Brothers & Johnson/Michels Corp. in Brownsville, Wisconsin. 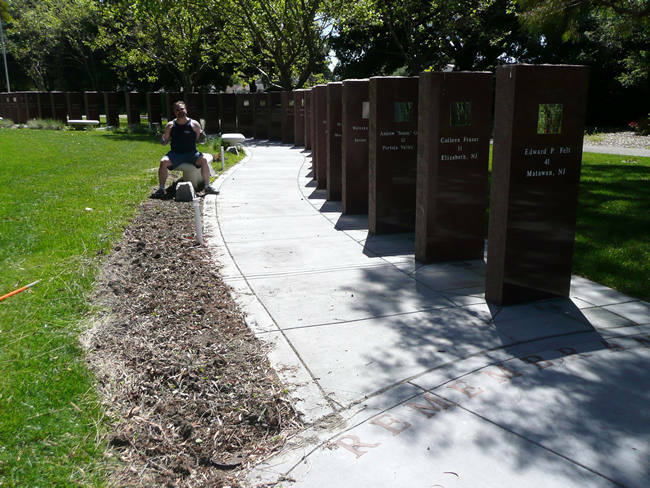 The 40 Remembrance stones, 1 extra blank Remembrance stone, and 2 Memorial Story Boards are all now delivered and stored at the Memorial site. They are wrapped up for their protection and ready to install at the Flight 93 Memorial site. 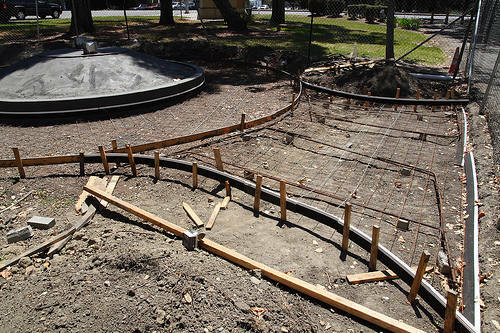 West view of the "Plaza of Remembrance" and the framing block outs and concrete pour that the two Donor Boards and one Sponsor Board will be put into. 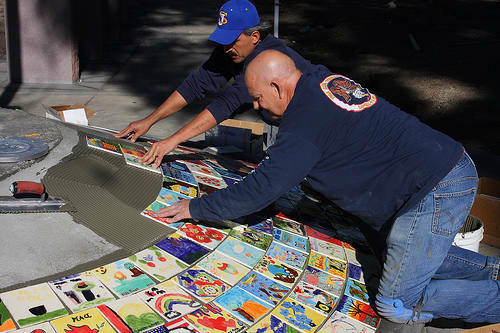 This magnificent work was donated by Alameda County Union volunteers. Week of 3 Dec 2006. 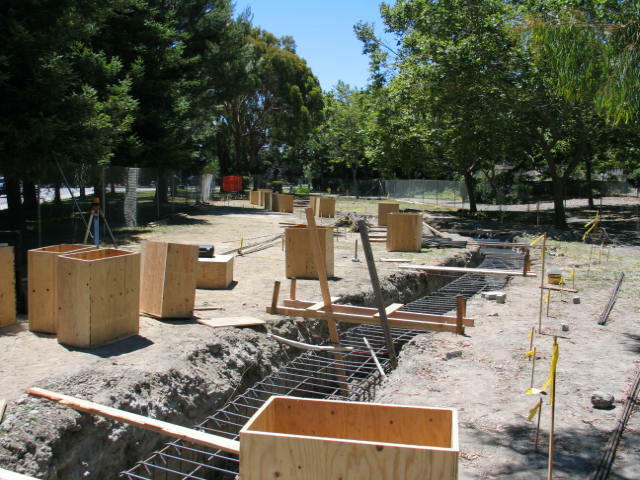 North view of the "Plaza of Remembrance" and the framing block outs and concrete pour that the two Donor Boards and one Sponsor Board will be put into. 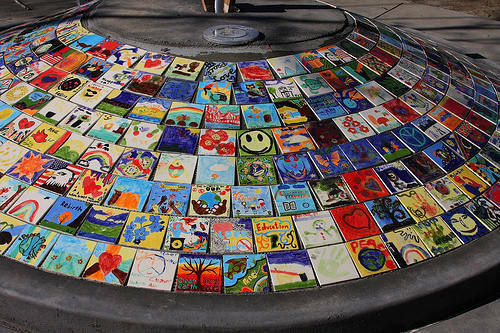 This magnificent work was donated by Alameda County Union volunteers. 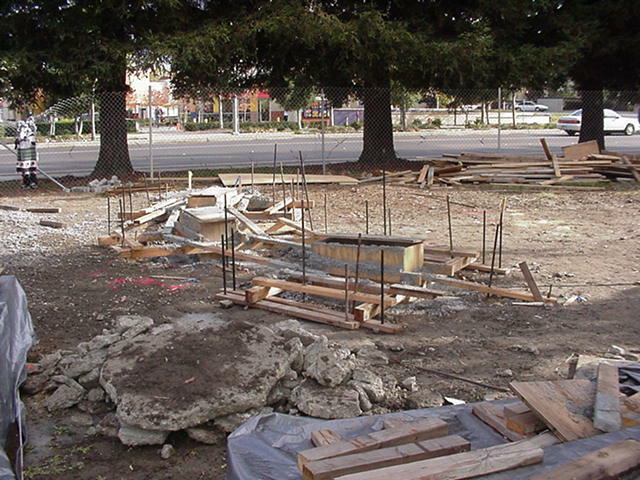 East view of the "Plaza of Remembrance" and the framing block outs and concrete pour that the two Donor Boards and one Sponsor Board will be put into. 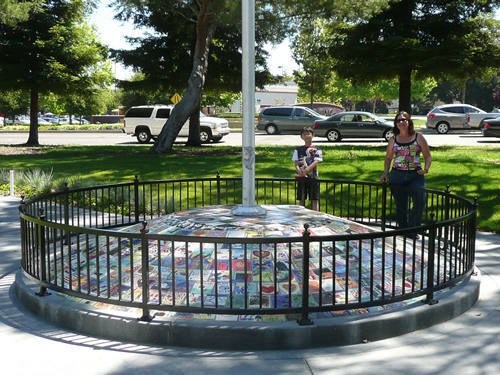 This magnificent work was donated by Alameda County Union volunteers. 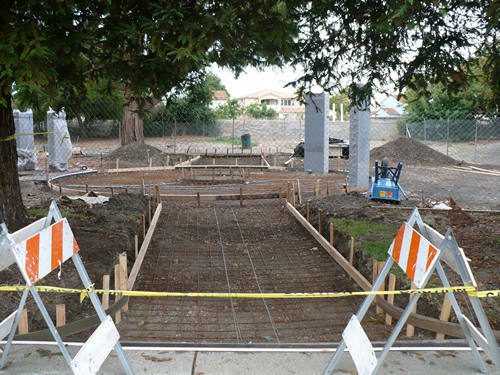 South view of the "Plaza of Remembrance" and the framing block outs and concrete pour that the two Donor Boards and one Sponsor Board will be put into. This magnificent work was donated by Alameda County Union volunteers. 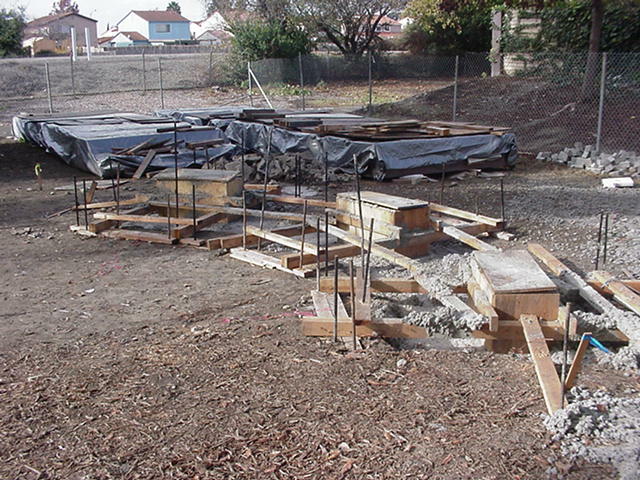 East view of the concrete block out work for the foundation of the Remembrance Stones. 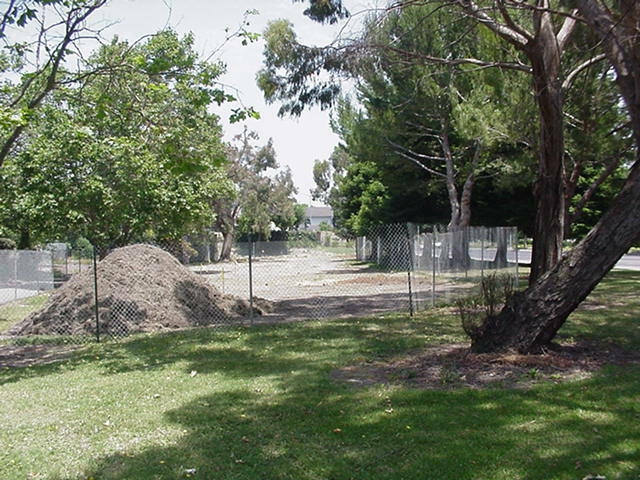 The area has been cleaned up in preparation of the next building step. Week of 18 Feb 2007. 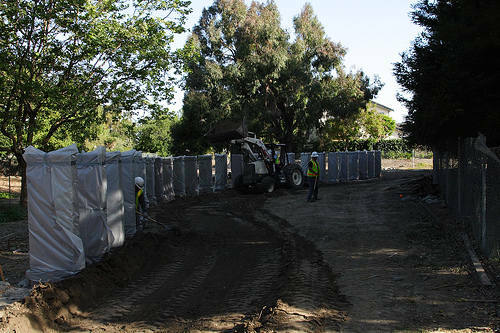 South view of the concrete blockouts, they are being cleaned out and prepared by a crew from Laborers Union Local #304. They are cleaning them up in preparation of the next building step of placing the stones near the blockouts for their installation. Week of 4 March 2007. 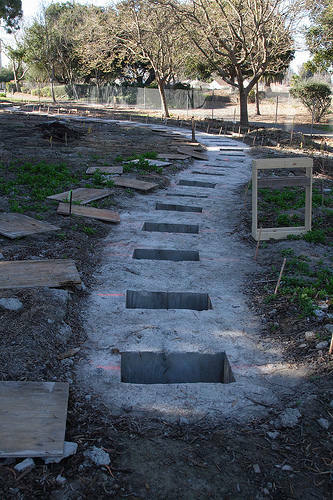 South view of the concrete blockouts being prepared for installing the Remembrance stones. Week of 11 March 2007. 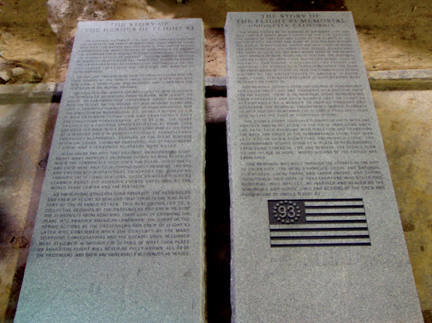 The Flight 93 Memorial Remembrance stones ready to be installed at the memorial site. Donated by Anderson Brothers & Johnson/Michels Corporation of Brownsville, Wisconsin. 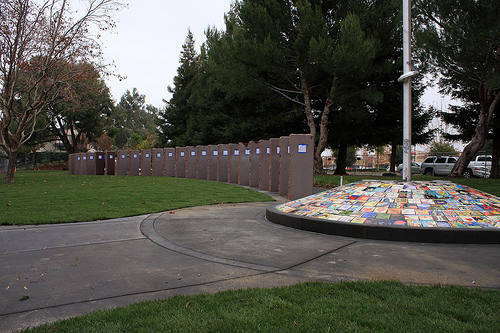 The installation of the Remembrance Stones which was donated by Operating Engineers Local 3 of Alameda County, Iron Workers Local 378 of Alameda County, Bricklayers & Allied Local 3 of Alameda County, and Union City employees. 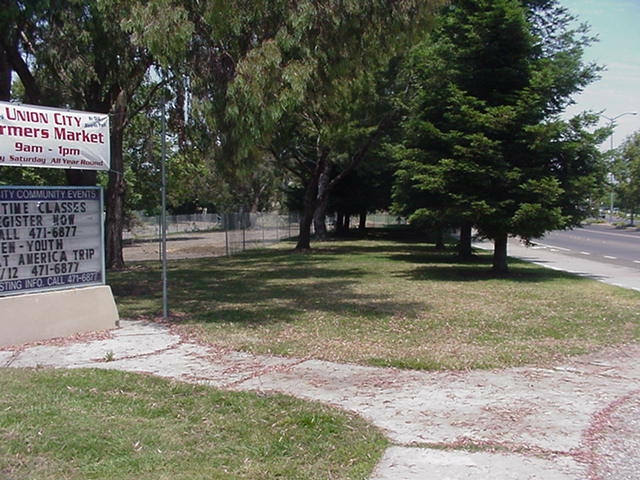 This was done on 20 March 2007. Week of 18 March 2007. 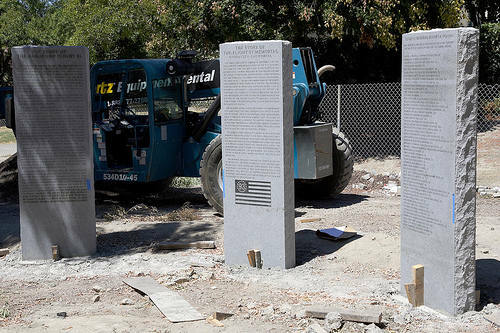 Union workers installing the Remembrance Stones, the labor was donated by Operating Engineers Local 3 of Alameda County, Iron Workers Local 378 of Alameda County, Bricklayers & Allied Local 3 of Alameda County, and Union City employees. The installation was done on 20 March 2007. 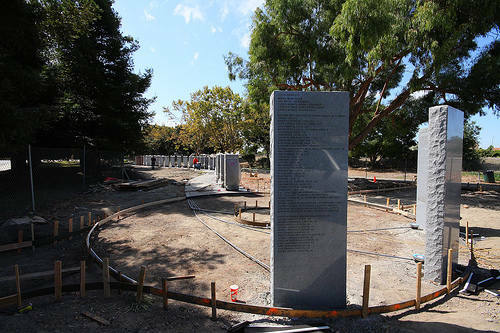 Union laborers installing Stones for the Flight 93 Memorial in Union City, CA. 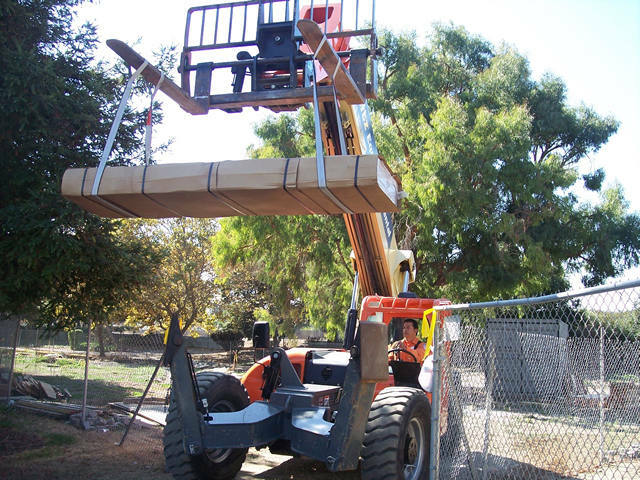 The labor was donated by Operating Engineers Local 3 of Alameda County, Iron Workers Local 378 of Alameda County, Bricklayers & Allied Local 3 of Alameda County, and Union City employees. The installation was done on 20 March 2007. A southern view of the Flight 93 Memorial Remembrance Stones just after most of them have been installed into their concrete blockouts. The stones still need to be leveled, balanced and set in concrete. A view facing south of the Flight 93 Memorial Remembrance Stones just after most of them have been installed into their concrete blockouts. 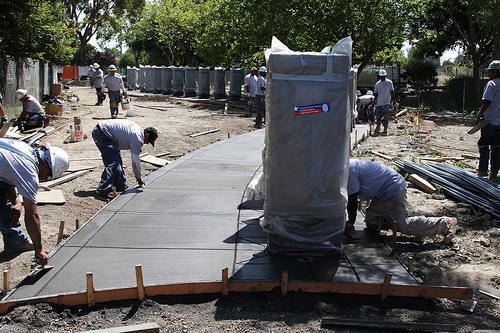 The stones that have the protective plastic on them have already been leveled, balanced and set in concrete. 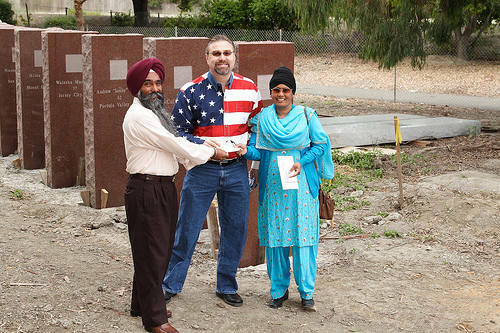 Memorial Originator Michael L. Emerson accepting a $1,000 donation check written out to Union City Friends from the Cheema family - Singh Pritam & Kaur Sarabjit of Union City, CA. 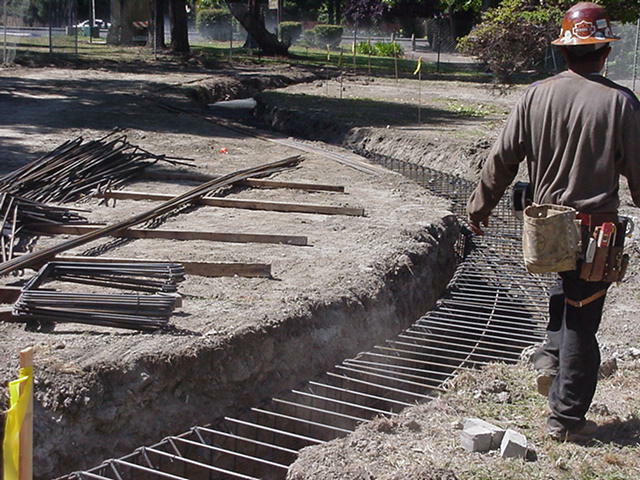 to help with the construction of the Memorial. Memorial Originator Michael L. Emerson during a live interview with NBC channel 11 news at 10:30am on Wednesday 4 April 2007, answering questions about the Memorial and its construction. 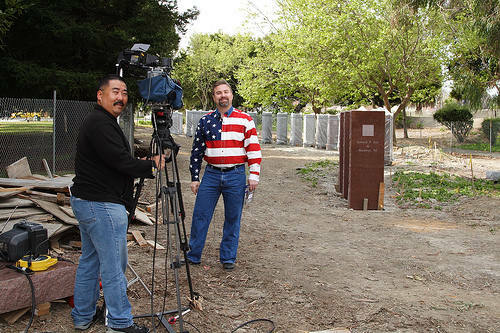 Memorial Originator Michael L. Emerson and video photographer Glenn Iyemura of NBC channel 11 news after doing the live interview at the Memorial site. 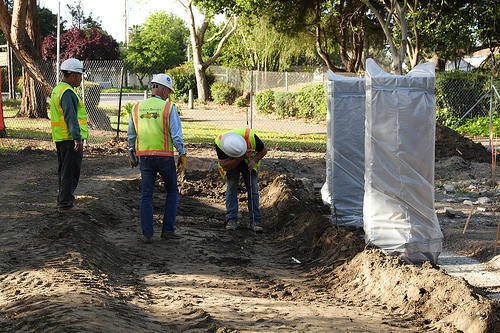 City and Union volunteer workers measuring and preparing the Memorial site for grading and the electrical, irrigation, and drainage piping. Week of 8 April 2007. 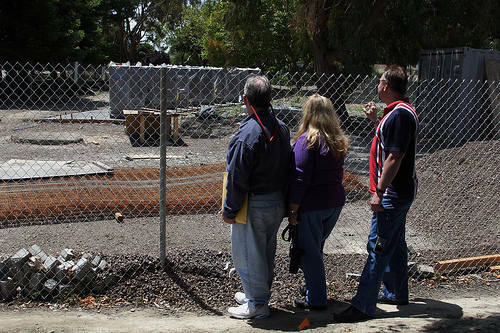 City and Union volunteer workers reviewing the electrical plans to layout the electrical cables and piping at the Memorial site. 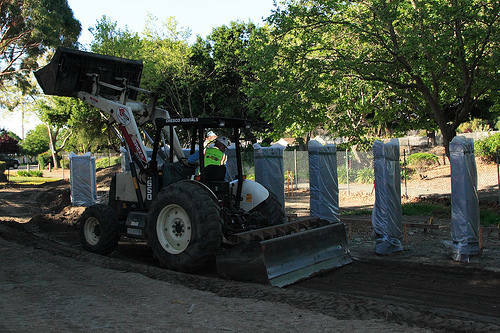 A Union volunteer worker grading the memorial site with a backhoe. 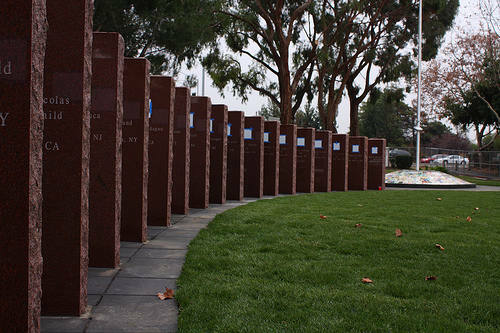 A view of the Memorial Remembrance Stones wrapped in plastic for their protection. Union volunteers finishing up the grading of the Memorial site. 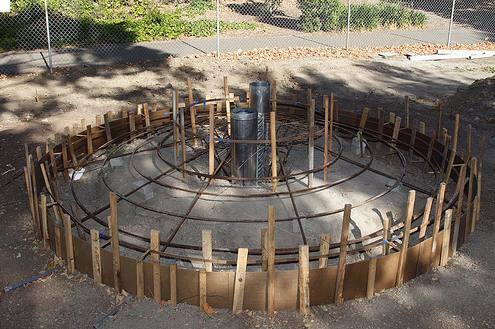 A view of the "Circle of Hope" during the concrete framing installation phase. 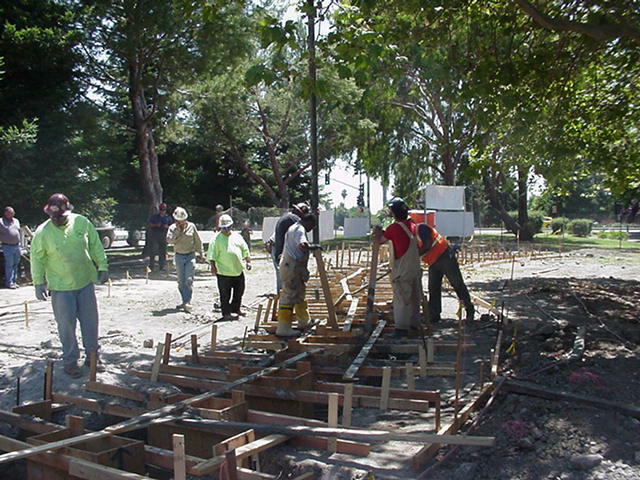 The Union and City volunteers are preparing the site for the another large concrete pour scheduled on 28 April 2007 at the Memorial site. Week of 15 April 2007. 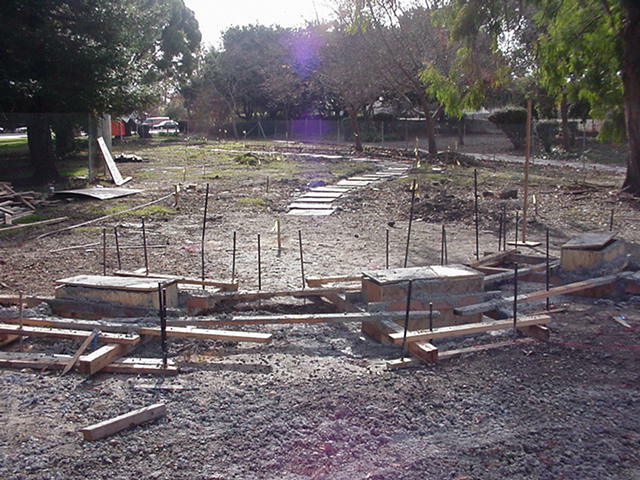 A view from the South looking North of the remembrance stones during the concrete framing installation phase. 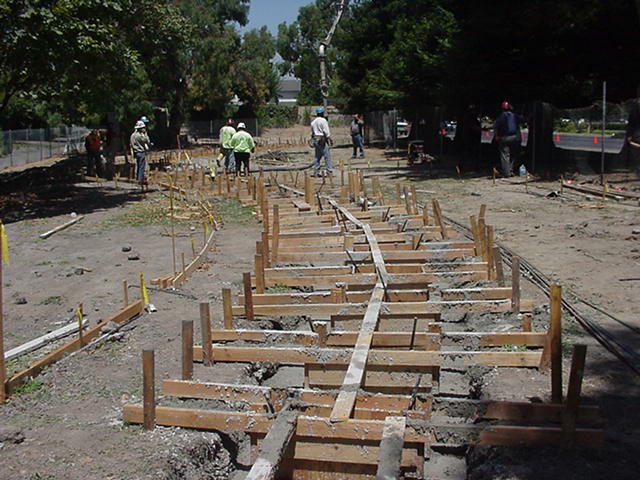 The Union and City volunteers are preparing the site for the another large concrete pour scheduled on 28 April 2007 at the Memorial site. 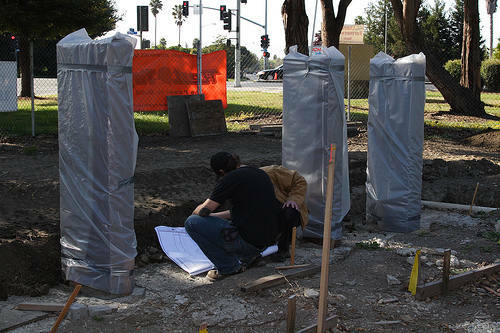 Union volunteer installing the electrical lighting piping and fixtures at the Memorial site. North view looking south of the electrical lighting piping and fixtures that have been installed at the Memorial site. 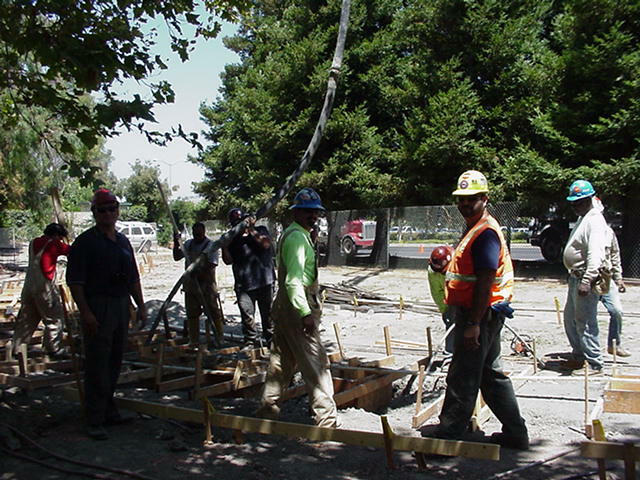 Personnel from Central Concrete of San Jose, CA and their concrete trucks preparing to unload/pour the concrete into the Memorial site. Week of 22 April 2007. Union workers/labors from Local 300 & 400 Cement Masons, Local 378 Iron Workers, Teamsters Local 853 and other volunteers all volunteering to help pour and install the cement/concrete at the Flight 93 Memorial site. Union workers/labors from Local 300 & 400 Cement Masons, Local 378 Iron Workers, Teamsters Local 853 and other volunteers smoothing out and finishing the cement/concrete at the Flight 93 Memorial site. 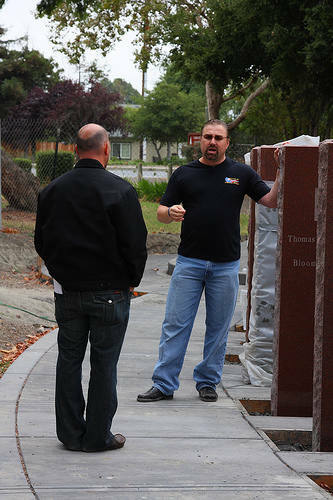 Memorial Originator Michael L. Emerson and a Union Representative looking over the beautiful and excellent concrete installation work done by the Union and Teamster volunteers at the Flight 93 Memorial, Union City, CA site. 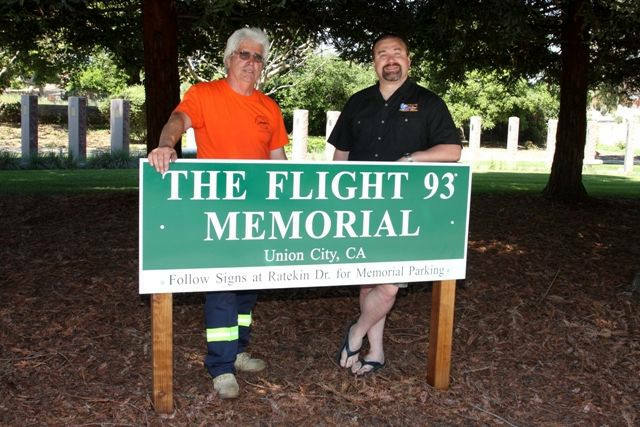 Memorial Originator Michael L. Emerson and the Union/Teamster volunteers from Local 300 & 400 Cement Masons, Local 378 Iron Workers, and Teamsters Local 853 at the Flight 93 Memorial, Union City, CA site after a job well done. Mary & Jay White the mother and step-father of Flight 93 Hero Ms. 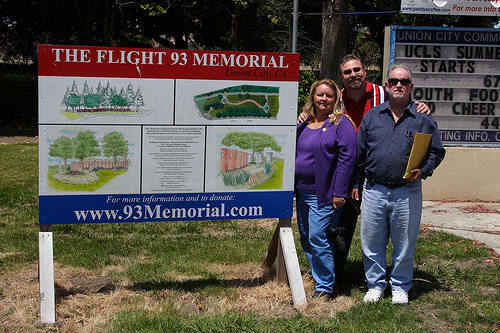 Honor "Beth" Wainio and Memorial originator Michael L. Emerson (center) at the Flight 93 Memorial Site. 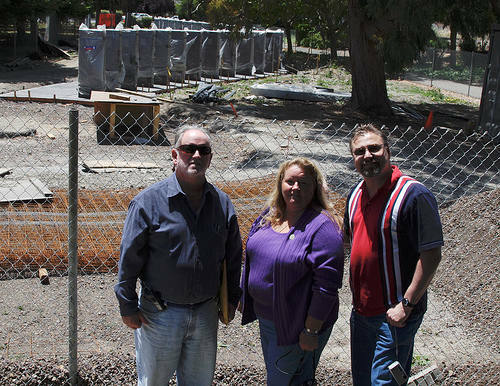 Mary & Jay came from Florida to see the Memorial, Michael gave them a private tour of the site and explained its design and construction process. Union City, CA. Week of 27 May 2007. Jay & Mary White the step-father and mother of Flight 93 Hero Ms. Honor "Beth" Wainio and Memorial originator Michael L. Emerson at Flight 93 Memorial Site. They came from Florida to see the Memorial. Union City, CA. Jay & Mary White the step-father and mother of Flight 93 Hero Ms. Honor "Beth" Wainio and Memorial originator Michael L. Emerson looking over the Flight 93 Memorial Site. Union City, CA. Mary White the mother Flight 93 Hero Ms. 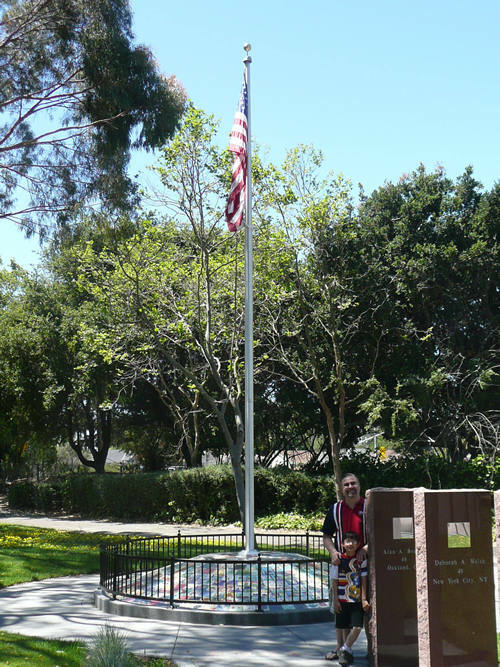 Honor "Beth" Wainio and Memorial originator Michael L. Emerson. Michael is explaining to Mary the design and construction process for the Flight 93 Memorial, Union City, CA. 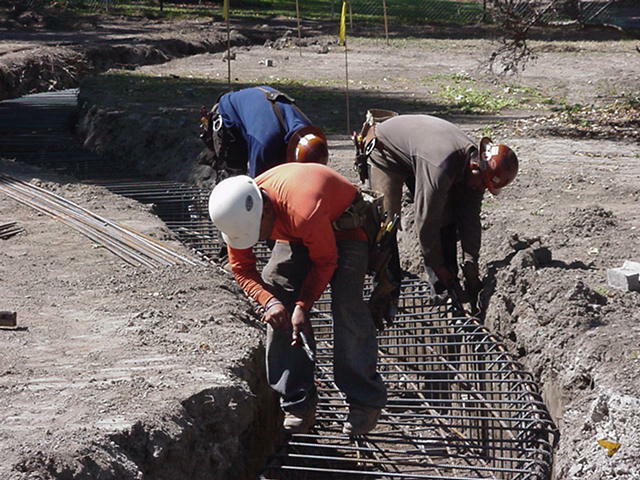 The framing work for the footing of the 25ft Flag Pole in the center of the "Circle of Hope" at the Flight 93 Memorial site. Week of 10 June 2007. 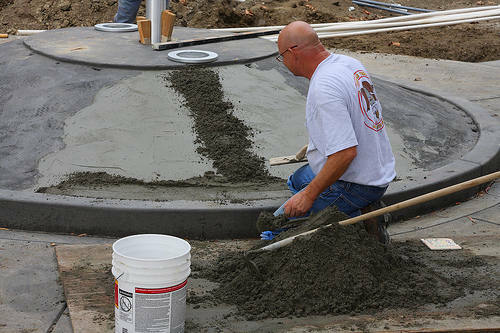 Union workers/labors from Putziester and Electrical Union Local 595 putting in the cement/concrete for the footing of the 25ft Flag Pole in the center of the "Circle of Hope" at the Flight 93 Memorial site. Union workers/labors from Putziester and Electrical Union Local 595, and a Union City worker Jerry ,doing the installation of the cement/concrete for the footing of the 25ft Flag Pole in the center of the "Circle of Hope" at the Flight 93 Memorial site. Union workers/labors from Putziester and Electrical Union Local 595 smoothing out the cement/concrete for the footing of the 25ft Flag Pole in the center of the "Circle of Hope" at the Flight 93 Memorial site. 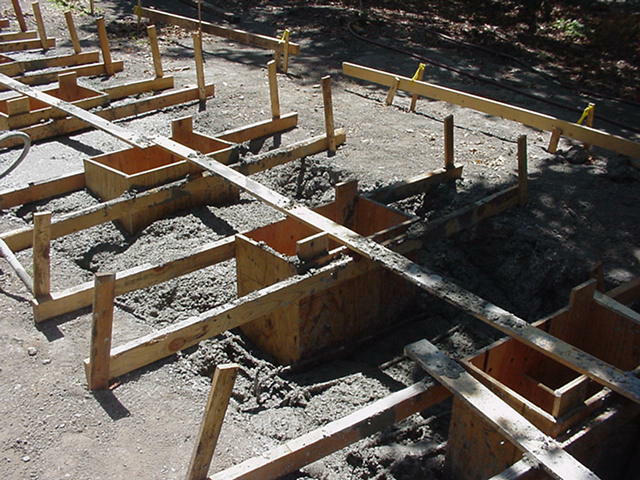 The forming work for the concrete pour of the "Circle of Hope" at the Flight 93 Memorial site. Week of 5 August 2007. Union workers/labors from Cement Masons Local 300 doing the installation and finishing of the cement/concrete for the "Circle of Hope" and part of the walkway for the Flight 93 Memorial site. 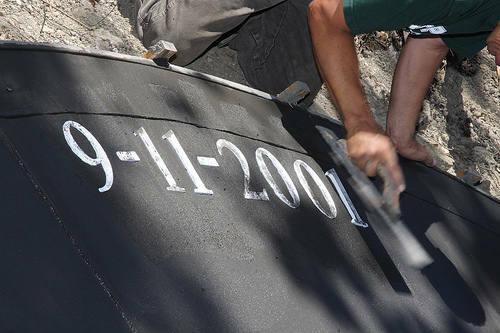 Union workers/labors from Cement Masons Local 300 installing the "9-11-2001" lettering in the "Circle of Hope" at the Flight 93 Memorial site. Union workers/labors from Cement Masons Local 300 doing the finishing of the cement/concrete for the "Circle of Hope" and part of the walkway for the Flight 93 Memorial site. 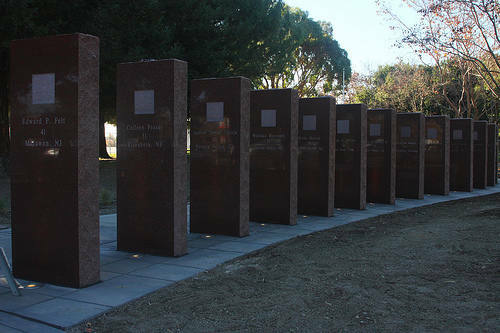 ATS Trucking (driver Ron Seibel), Union laborers and City workers preparing to off-load the last six (corrected) Remembrance Stones and the one Donor/Sponsor board to be installed at the Flight 93 Memorial, Union City, CA site. Week of 12 August 2007. 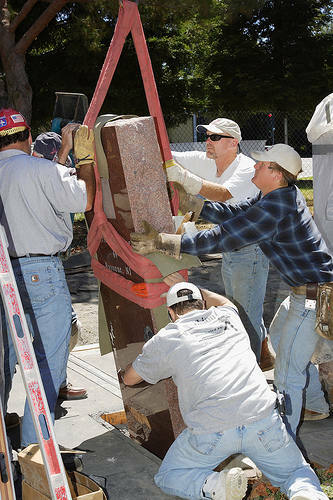 Union laborers and City workers off-loading the last six (corrected) Remembrance Stones and the one Donor/Sponsor board to be installed at the Flight 93 Memorial, Union City, CA site. 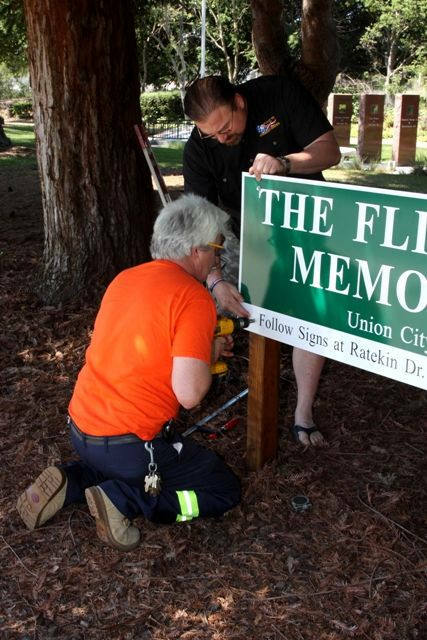 Union laborers and City workers installing the last six (corrected) Remembrance Stones at the Flight 93 Memorial, Union City, CA site. A frontal view of the two Story boards and the one Donor/Sponsor board just after they were installed by the following Unions: Local 3 Operators, Local 3 Allied Craft & Brick Layers, and Local 378 Iron Workers. 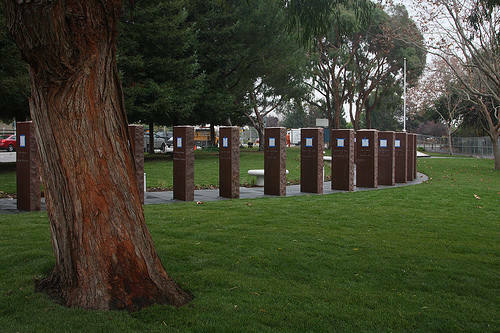 They have been installed in the "Circle of Remembrance Plaza" of the Flight 93 Memorial, Union City, CA site. 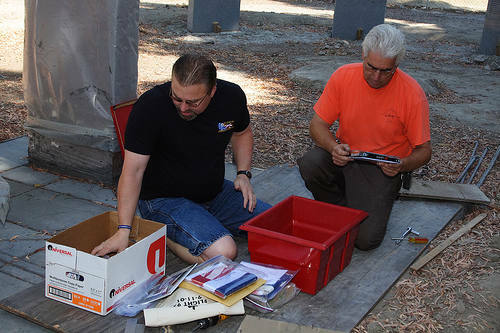 Michael L. Emerson the Flight 93 Memorial's Originator and Union City worker Bill Bontadelli putting in various items into the time capsule prior to it being installed and in-cased in concrete at the Memorial site. The plan is to open the time capsule in 50 years. Week of 26 August 2007. 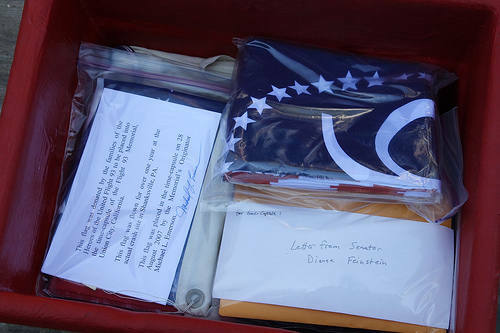 Various items donated from the Heroes families, newspaper articles, documents, letters, flags, CDs and DVDs of the layout, design, and web site, and other Flight 93 Memorial memorabilia in the time capsule. Nothing of monetary value, just historical value. To be opened in 50 years and given to a museum. 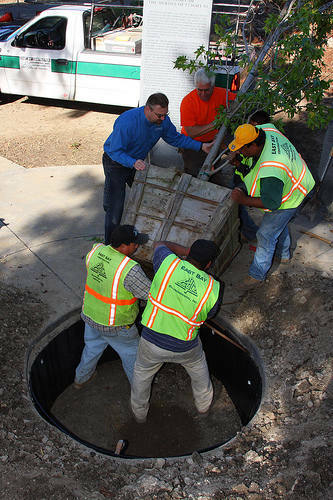 Michael L. Emerson the Flight 93 Memorial's Originator and Union City worker Bill Bontadelli installing the time-capsule into its concrete box at the Memorial site. 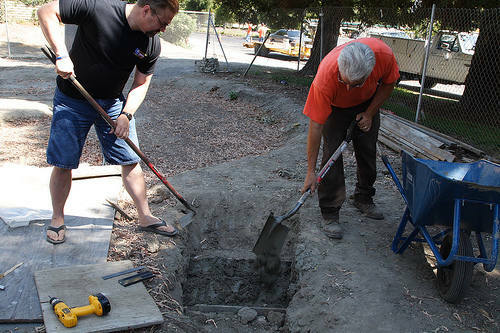 The plan is to open the time capsule in 50 years. Michael L. Emerson the Flight 93 Memorial's Originator and Union City worker Bill Bontadelli covering up the time-capsule and sealing it with concrete to completely in-case it at the Memorial site. 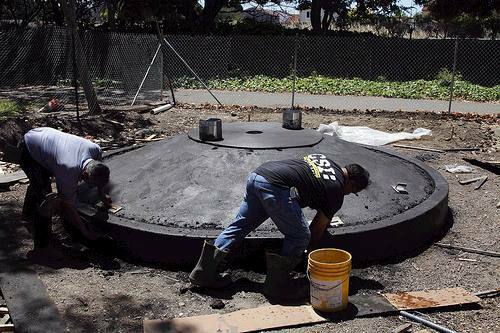 The plan is to open the time capsule in 50 years. 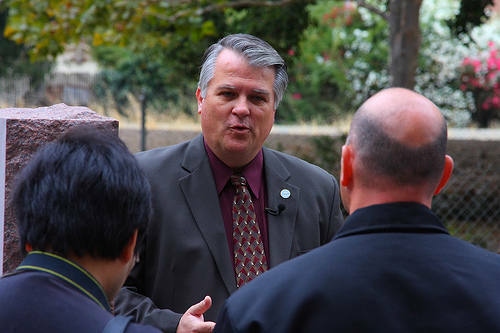 The City Manager of Union City Mr. Larry Cheeves being interviewed by NBC Channel 11 News at the Flight 93 Memorial site, Union City, California. 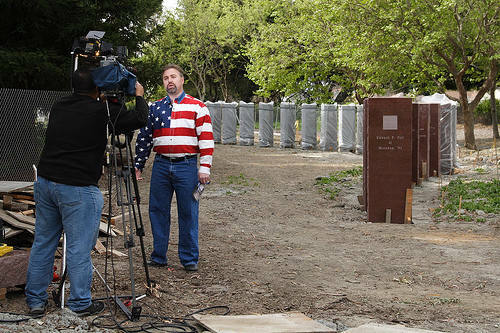 The Memorial's Originator Michael L. Emerson being interviewed by NBC Channel 11 News at the Flight 93 Memorial site, Union City, California. 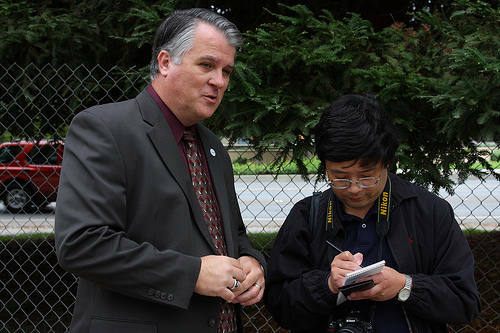 The City Manager of Union City Mr. Larry Cheeves being interviewed by The China World Journal at the Flight 93 Memorial site, Union City, California. 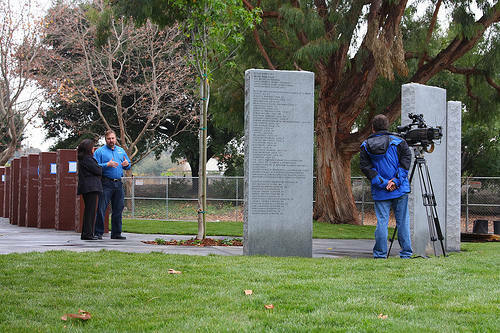 The Memorial's Originator Michael L. Emerson being interviewed by KTVU Channel 2 News at the Flight 93 Memorial site, Union City, California. 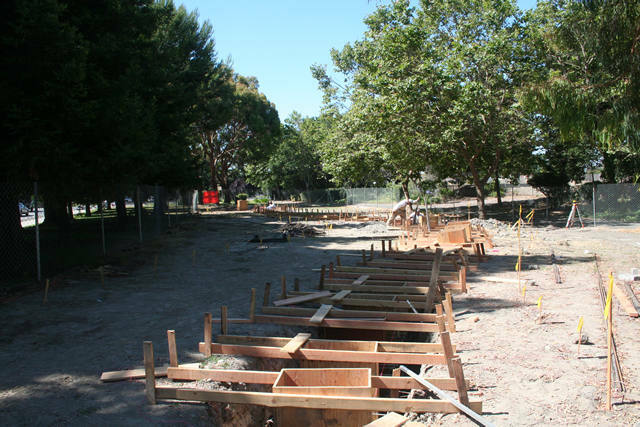 A view from the NorthWest looking SouthEast of the Donor / Story Board Stones during the concrete framing installation phase for the Remembrance Plaza and Walkway. 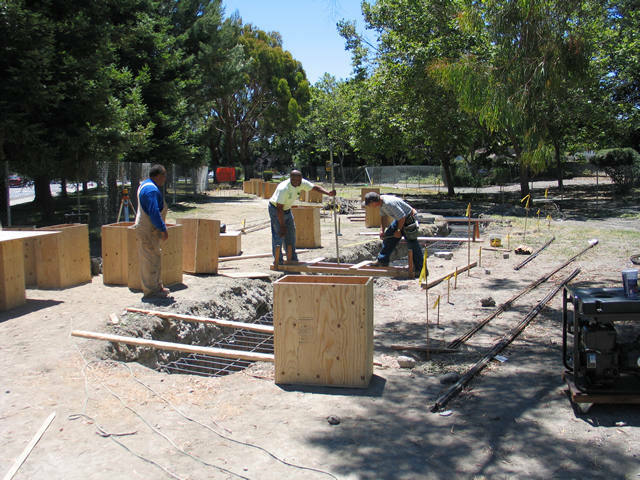 The Union and City volunteers prepared the site for the final concrete pour at the Memorial site. Week of 16 Sept 2007. 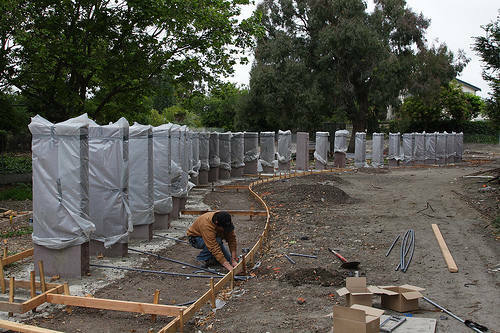 A view from the North looking South of the Donor / Story Board Stones during the concrete framing installation phase for the Remembrance Plaza and Walkway. 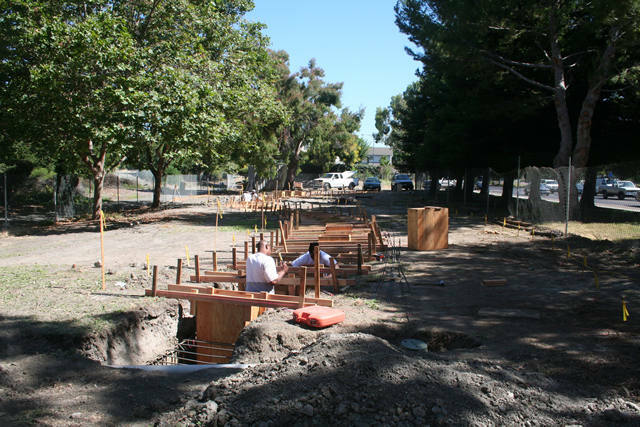 The Union and City volunteers prepared the site for the final concrete pour at the Memorial site. A view from the West looking East of the Donor / Story Board Stones during the concrete framing installation phase for the Remembrance Plaza and Walkway. 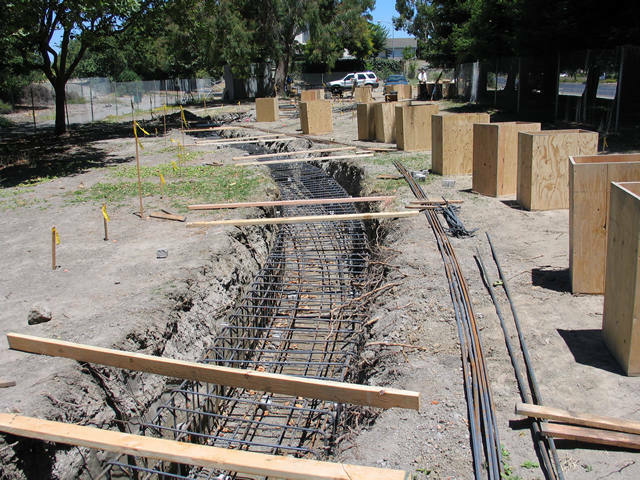 The Union and City volunteers prepared the site for the final concrete pour at the Memorial site. 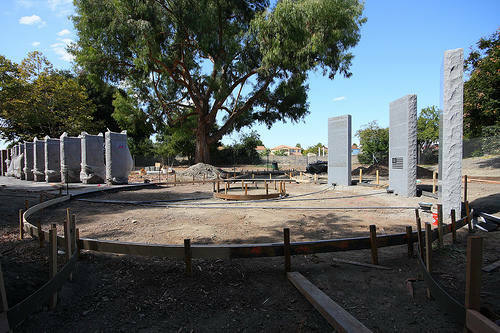 A view from East looking West of the Donor / Story Board Stones during the concrete framing installation phase for the Remembrance Plaza and Walkway. 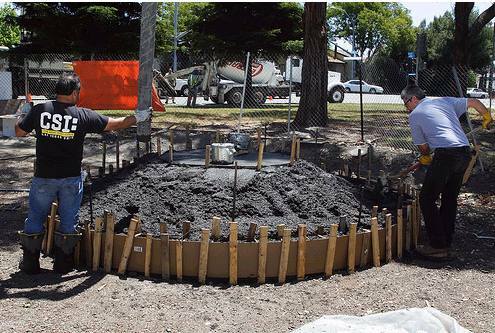 The Union and City volunteers prepared the site for the final concrete pour at the Memorial site. 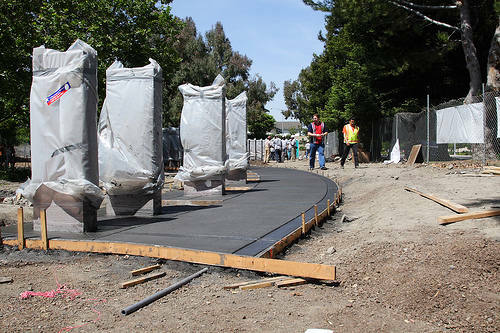 A top view of the Memorial site and Union workers and apprentices from the "Northern California Cement Masons Joint Apprenticeship and Training Committee" volunteering to pour and finish the last concrete installation for the Flight 93 Memorial's Remembrance Plaza, Bench supports, and Walkway. 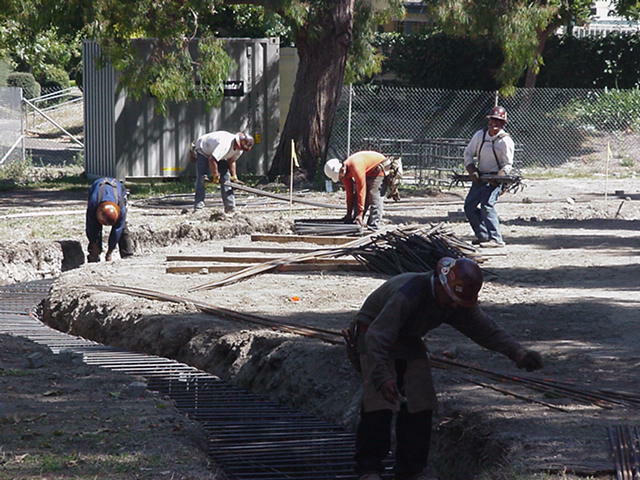 Other Unions who helped are: Operators & Engineers, Locals 3 & 4 also Iron Workers, Local 378. Week of 6 October 2007. 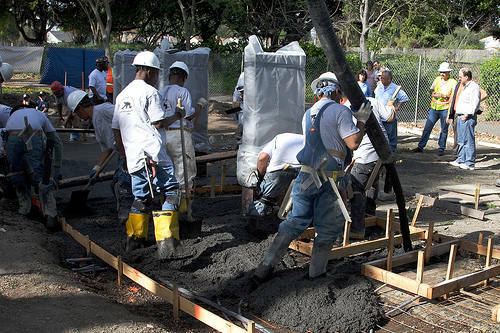 Union workers and apprentices from the "Northern California Cement Masons Joint Apprenticeship and Training Committee" volunteering to pour and finish the last concrete installation for the Flight 93 Memorial's Remembrance Plaza, Bench supports, and Walkway. 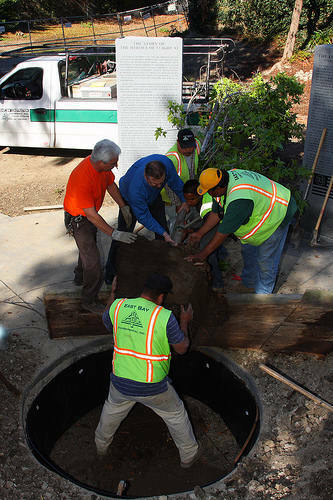 Other Unions who helped are: Allied Craft & Brick Layers, Local 3 and Cement Masons, Local 300 & 400. 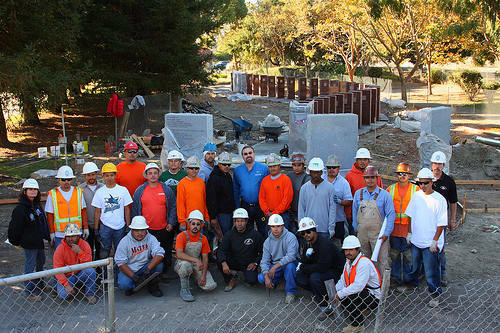 Union teachers and apprentices from the "Northern California Cement Masons Joint Apprenticeship and Training Committee" volunteering to pour and finish the last concrete installation for the Flight 93 Memorial's Remembrance Plaza, Bench supports, and Walkway. 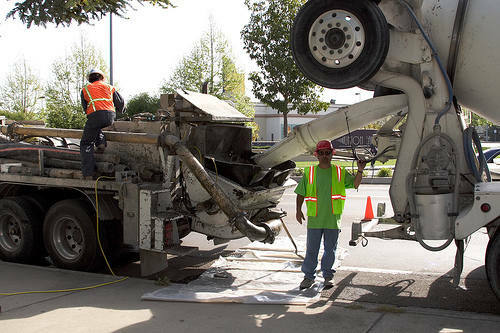 Other Unions who helped are: Teamsters, Local 853 and Electricians, Local 595. 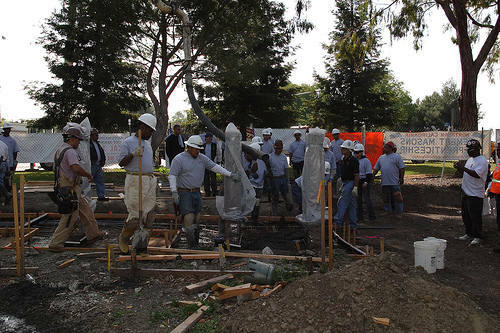 Union workers, teachers and apprentices from the "Northern California Cement Masons Joint Apprenticeship and Training Committee" volunteering to pour and finish the last concrete installation for the Flight 93 Memorial's Remembrance Plaza, Bench supports, and Walkway. 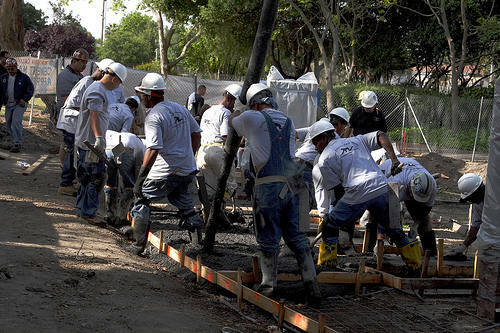 Other Unions who helped are: Carpenters, Local 713 and Laborer's Union, Local 304. 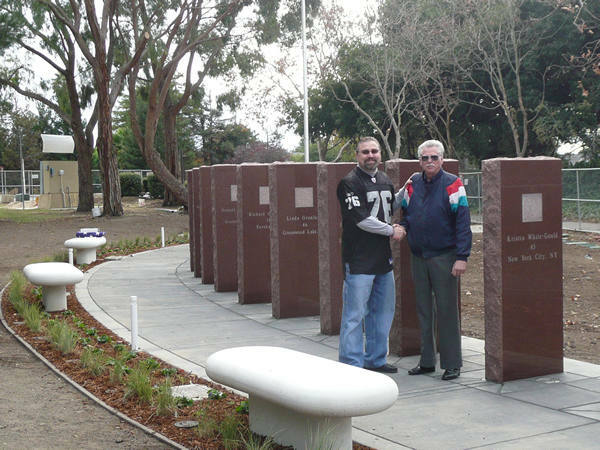 Michael L. Emerson, the Memorial's Originator standing in the Circle of Remembrance with the Sponsor and Story Boards after the new movable fence has been installed. This will allow the landscapers to landscape all of the Park and Union City and the Unions to complete the Flight 93 Memorial. Week of 14 October 2007. 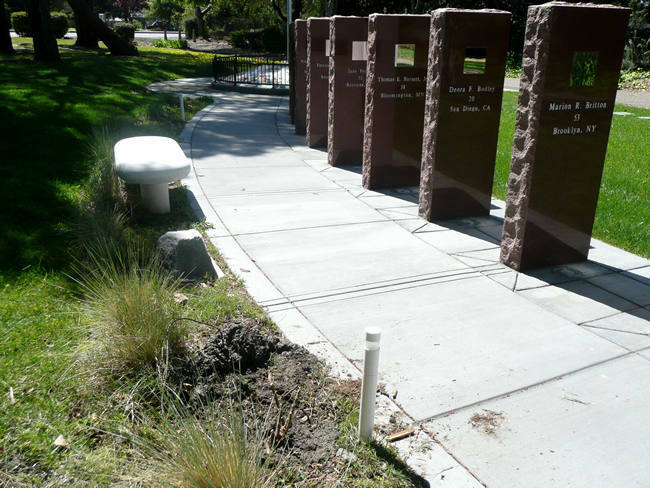 A view of the front of the Remembrance Stones and walkway (facing north to south) after the new movable fence has been installed. This will allow the landscapers to landscape all of the Park and Union City and the Unions to complete the Flight 93 Memorial. 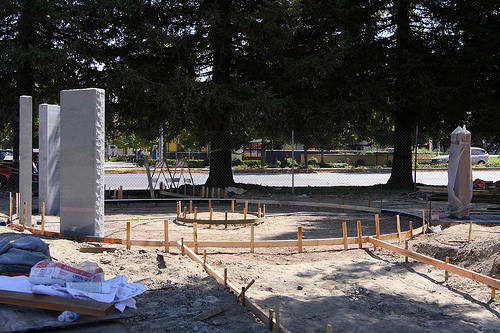 A view of the unfinished Circle of Hope (facing south to north) after the new movable fence has been installed. 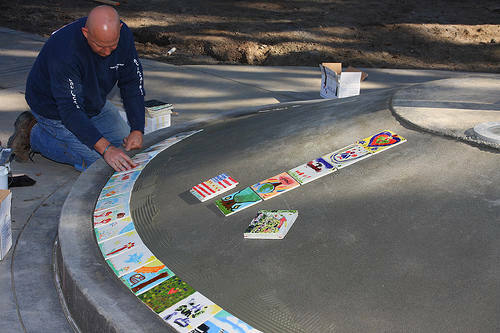 The Circle of Hope still needs the Flag pole and the hand painted children's Tiles to be installed by Union City and the Unions towards completing the Flight 93 Memorial. 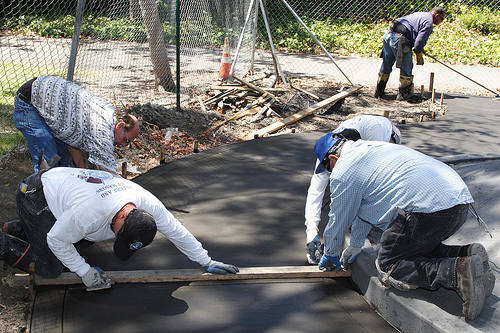 Union City workers fixing and connecting Union City's asphalt neighborhood walkway to the Memorial's concrete walkway in preparation for the landscapers to landscape all of the Park, and Union City and the Unions to complete the Flight 93 Memorial. Volunteer Union workers from local 355 and the Landscapers Union installing the water sprinkler system and piping for the Flight 93 Memorial. 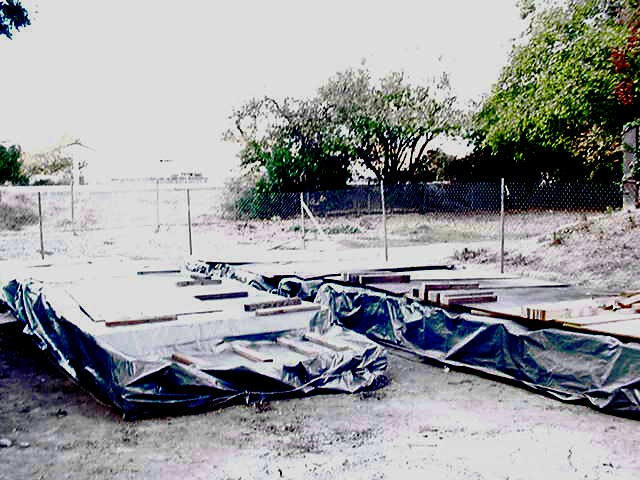 Also seen are the concrete benches ready to be installed. In the background is a nice view of some of the Remembrance Stones. Week of 11 November 2007. Volunteer Union workers from local 355 and the Landscapers Union grading the site and installing the water sprinkler system for the Flight 93 Memorial. 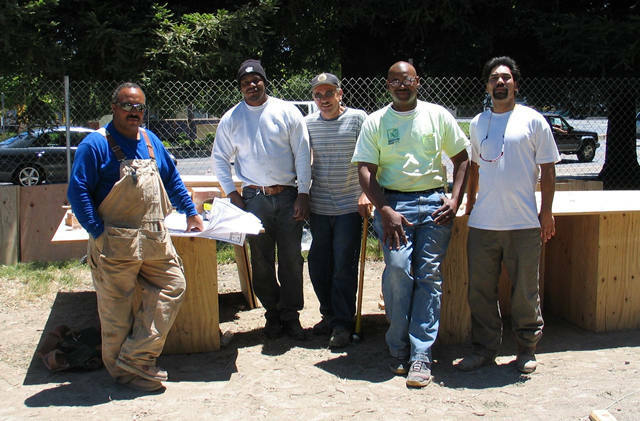 Volunteer Union workers from local 355 and the Landscapers Union grading the site. 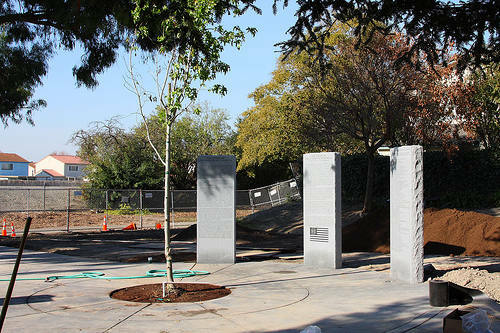 Also seen in the background are the newly trimmed redwood trees adjacent to the Dyer Street, allowing a better view of the Memorial site from the Street. 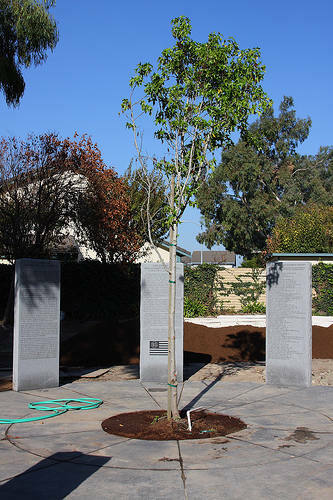 The Remembrance Tree donated and delivered to the site by Pacific Nurseries, it will be installed in the center of the Memorial's Circle of Remembrance at 11am on Wednesday 21 Nov 2007. 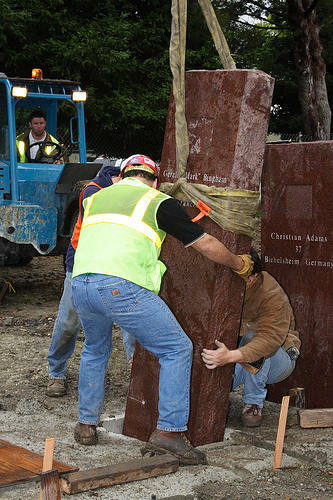 Volunteer union workers from bricklayers/tilelayers local 3, ironworkers local 378 and the landscapers local 355 working at the Memorial site. They are installing the 25ft flag pole donated by The Flag Factory. Week of 18 November 2007. 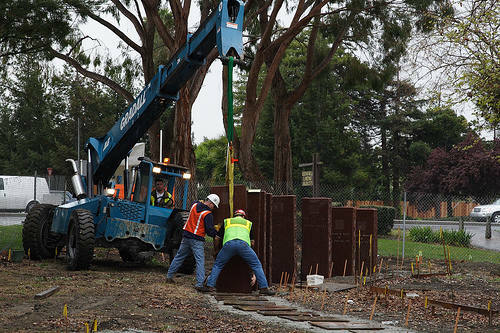 Volunteer union workers from bricklayers/tilelayers local 3, ironworkers local 378 and the landscapers local 355 working at the Memorial site. They are setting the 25ft flag pole donated by The Flag Factory. 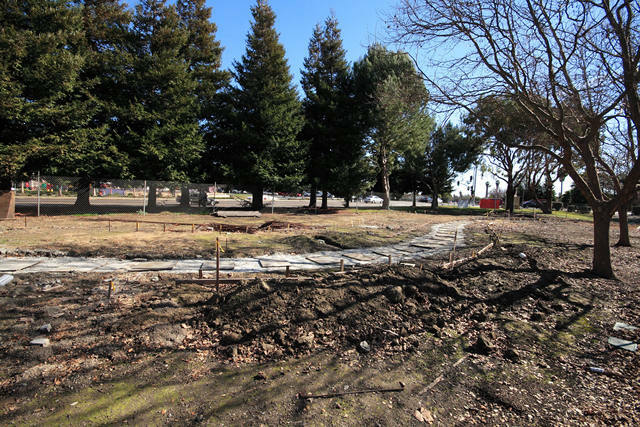 A view from south to north of the Memorial site during the building process after the flag pole and sprinkler system have been installed. 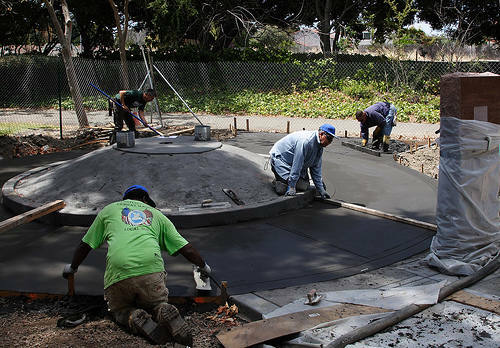 Also seen is the mortar prep work for installing the tiles around the base of the flag pole. 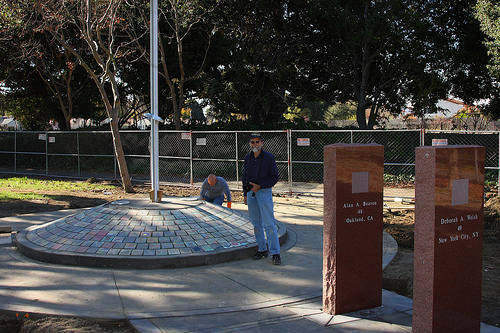 Volunteer union workers from bricklayers/tilelayers local 3 doing the mortar prep work for installing the tiles around the base of the flag pole at the Memorial site. 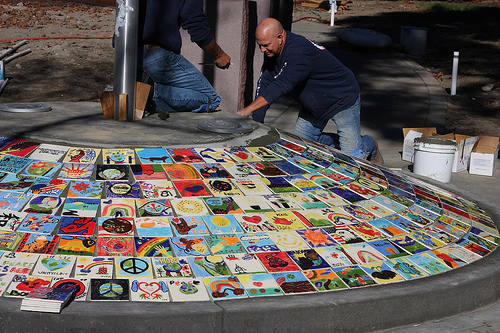 Volunteer union workers from bricklayers/tilelayers local 3 installing the tiles made by Union City students with their "vision of the future" around the base of the flag pole in the Circle of Hope at the Flight 93 Memorial site. 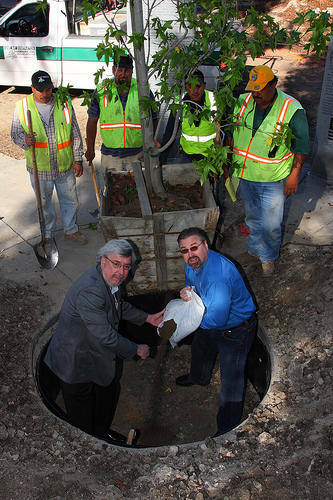 Union City Deputy City Manager Tony Acosta and the Memorial's Originator Michael L. Emerson with volunteer union workers from East Bay Construction Company preparing to install the Remembrance Tree. 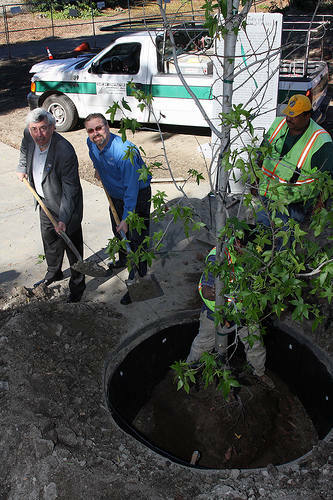 Michael & Tony are pouring the dirt into the tree's hole in the center of the Remembrance Circle. The dirt was supplied from the actual crash site of Flight 93 in Shanksville, PA. 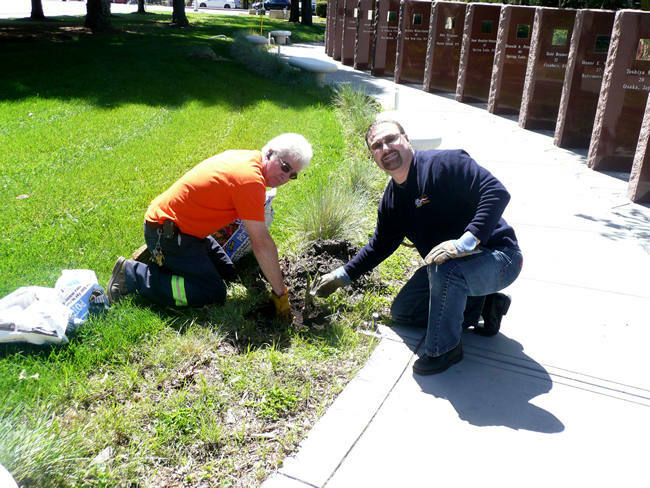 The dirt was supplied to the Memorial by Ken Nacke who is hero Louis Joseph Nacke's brother. 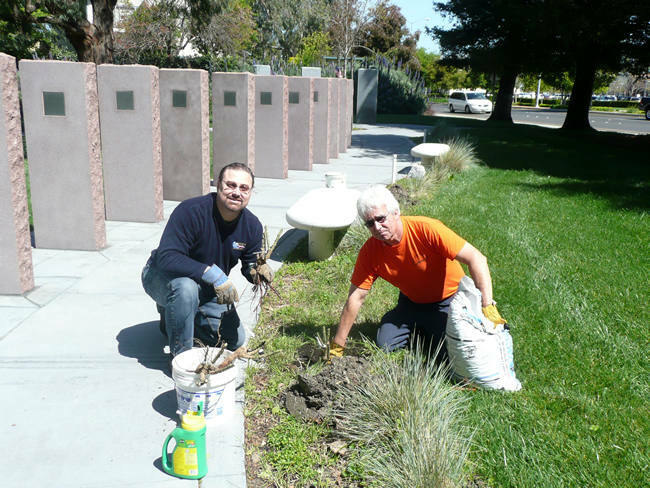 Union City Deputy City Manager Tony Acosta and the Memorial's Originator Michael L. Emerson with volunteer union workers from East Bay Construction Company preparing to install the Remembrance Tree. Michael is holding some of the Flight 93 crash site dirt in the tree's hole in the center of the Memorial's Remembrance Circle. The essence and spirit of the heroes and crash site will be absorbed into the tree from it's roots. 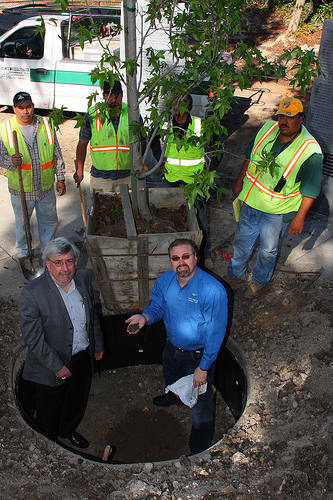 Michael L. Emerson the Memorial's Originator, Bill Bontadelli (in orange) and volunteer union workers from East Bay Construction Company installing the Remembrance Tree. The tree is being installed on top of the dirt that was supplied from the actual crash site of Flight 93 in Shanksville, PA.
Union City Deputy City Manager Tony Acosta and the Memorial's Originator Michael L. Emerson shoveling dirt around the Remembrance Tree that has been installed in the middle of the Flight 93 Memorial's Circle of Remembrance. The Remembrance Tree in the center of the Circle of Remembrance at the Flight 93 Memorial, Union City. Dan Swiger who is the official photographer for the Flight 93 Memorial, Union City at the Memorial site near the flag pole in the Circle of Hope. Donated flowers and plants from Pacific Nurseries ready to be installed at the Flight 93 Memorial. Week of 25 November 2007. 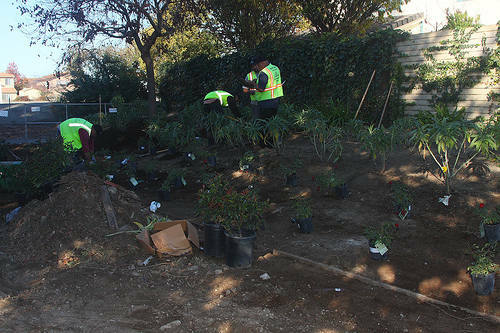 Donated flowers and plants from Pacific Nurseries being prepared and installed by union landscape volunteers and city workers at the Flight 93 Memorial. View from south to north of the Memorial site with the beginning of the landscaping and the landscape border installed at the Flight 93 Memorial. Lighted remembrance stones near dusk at the Flight 93 Memorial. Memorial Originator Michael L. Emerson going over the dedication Flag program with Bill Fournell. Bill is coordinating the Flag and Honor guard ceremonies for the dedication of the Flight 93 Memorial, Union City on Saturday 8 Dec 2007. Week of 2 Dec 2007. 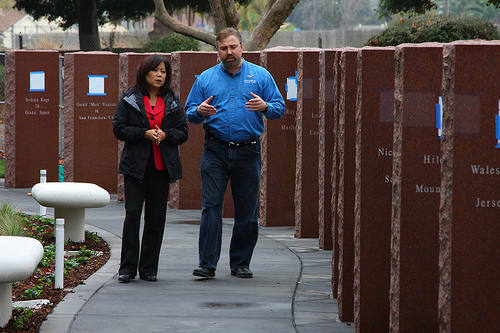 Michael L. Emerson, the Memorial's originator during a TV interview on Tuesday 4 Dec 2007 with Linda Yee of CBS channel 5 News at the Flight 93 Memorial, Union City. Michael L. Emerson, the Memorial's originator discussing the Memorial site during a TV interview on Tuesday 4 Dec 2007 with Linda Yee of CBS channel 5 News at the Flight 93 Memorial, Union City. Michael L. Emerson, the Memorial's originator talking about the Memorial during a TV interview on Tuesday 4 Dec 2007 with reporter Linda Yee of CBS channel 5 News at the Flight 93 Memorial, Union City. 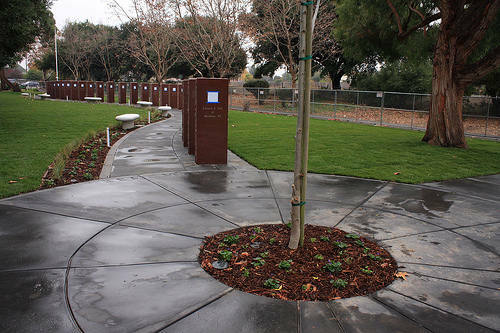 A north to south view of the 93 Memorial site after the ground cover has been installed. 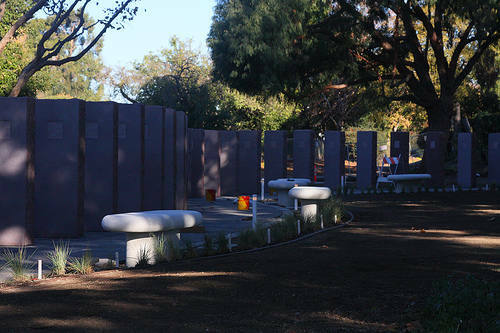 A north to south backside view of the 93 Memorial site after the ground cover has been installed. 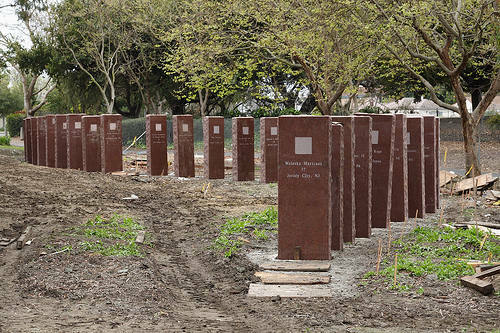 A west to east view of the 93 Memorial site after the ground cover has been installed. 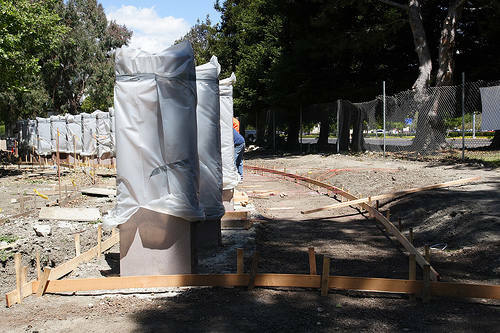 A south to north view including the flag pole dome and tiles at the 93 Memorial site after the ground cover has been installed. A north to south view of the Flight 93 Memorial site after the installation of a metal fence to protect the memorial's flag pole and the hand painted tiles in the memorial's Circle of Hope. Week of 11 May 2008. A west to east view of the Flight 93 Memorial site after the installation of a metal fence to protect the memorial's flag pole and the hand painted tiles in the memorial's Circle of Hope. A east to west view of the Flight 93 Memorial site after the installation of a metal fence to protect the memorial's flag pole and the hand painted tiles in the memorial's Circle of Hope. A south to north view of the Flight 93 Memorial site after the installation of a metal fence to protect the memorial's flag pole and the hand painted tiles in the memorial's Circle of Hope. 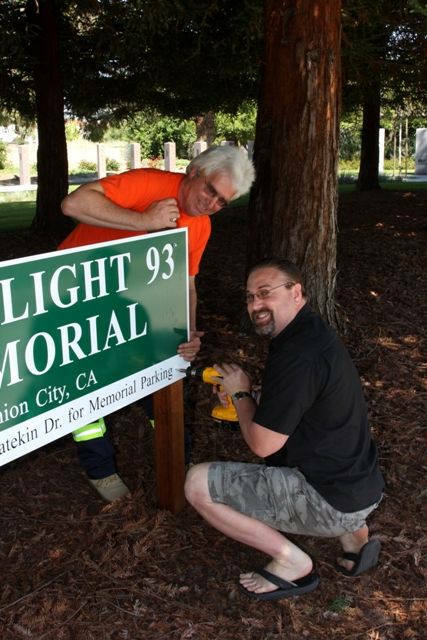 Park Mgr Bill Bontadelli and Memorial Originator Michael L. Emerson Installing a new Park sign at the Flight 93 Memorial site. 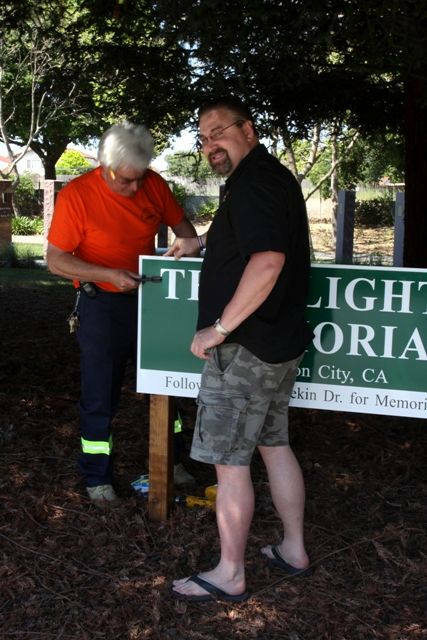 The sign was donated by Prismatic Signs, Milpitas, CA. Week of 19 April 2009. Park Mgr Bill Bontadelli and Memorial Originator Michael L. Emerson installing five of "The 9/11 Flight 93 Rose" bushes at the Flight 93 Memorial site. The genetic one of a kind rose was donated by J.B. Williams & Associates of Silver Spring, Maryland The Rose Bushes were bought & donated by Michael L. Emerson. Memorial Originator Michael L. Emerson installing five of "The 9/11 Flight 93 Rose" bushes at the Flight 93 Memorial site. The genetic one of a kind rose was donated by J.B. Williams & Associates of Silver Spring, Maryland The Rose Bushes were bought & donated by Michael L. Emerson. Installation of five "The 9/11 Flight 93 Rose" bushes at the Flight 93 Memorial site. We planted one rose in between each of the six benches. The genetic one of a kind rose was donated by J.B. Williams & Associates of Silver Spring, Maryland The Rose Bushes were bought & donated by Michael L. Emerson. 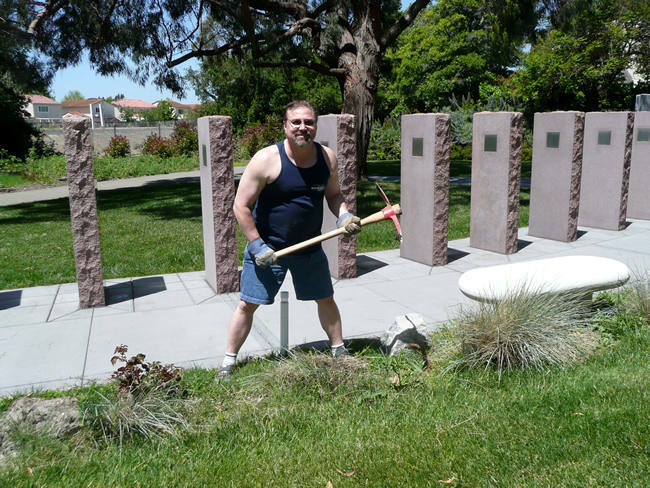 Flight 93 Memorial Originator and Co-Designer Michael L. Emerson helping to clear out weeds and old plants along the Memorial's walking path and around the Memorial's benches. 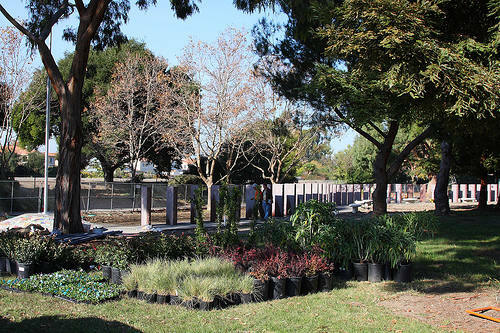 This will allow Union City Parks to install ground cover bark instead, thus accentuating the five "The 9/11 Flight 93 Rose" bushes. 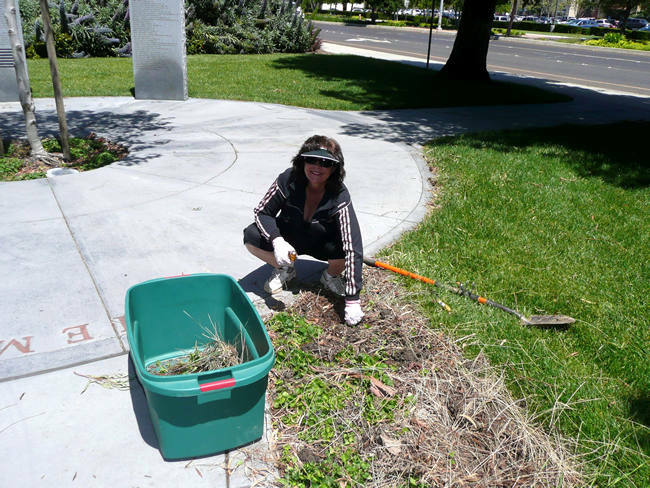 Mary Greenlee helping to clear out weeds and old plants along the Memorial's walking path and around the Memorial's benches. 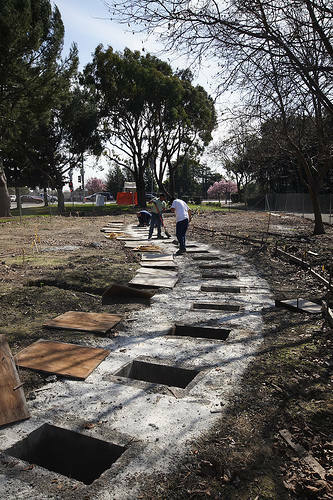 This will allow Union City Parks to install ground cover bark instead, thus accentuating the five "The 9/11 Flight 93 Rose" bushes. 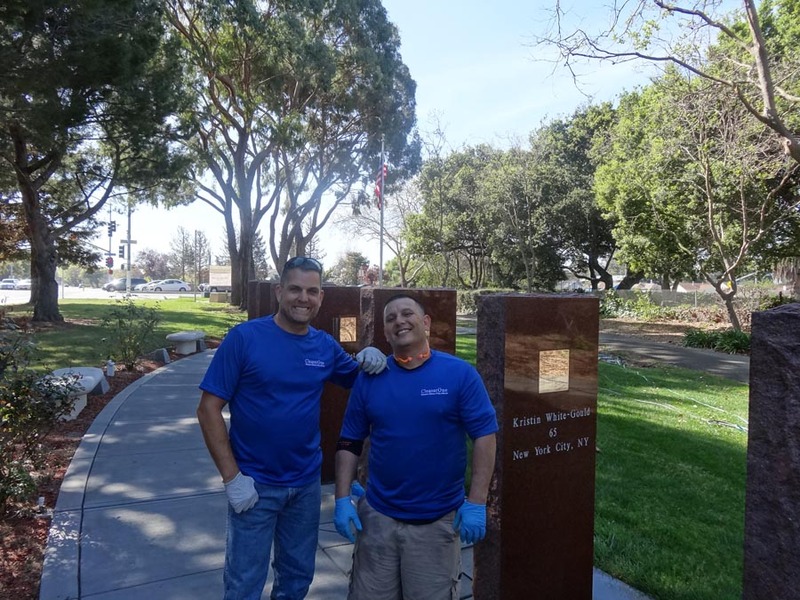 Professional granite, stone, tile and concrete cleaning company "Cleaner One" DONATING their time and effort to power wash, color enhance and seal the granite, tile, and concrete of the Flight 93 Memorial in Union City, California. Pictured is Paul Beaton (owner) and Sean. 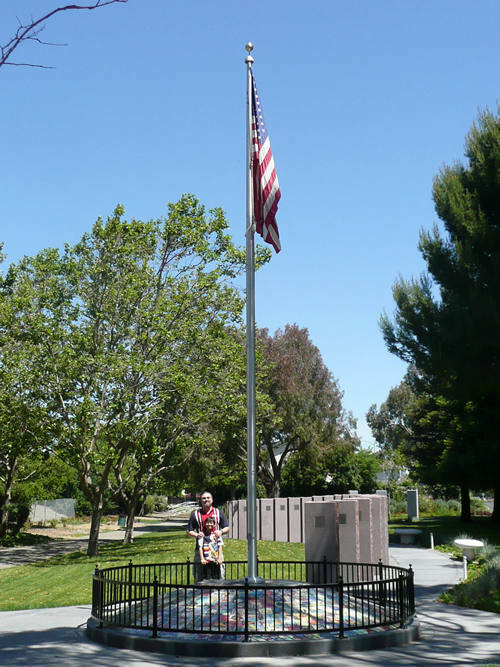 Professional granite, stone, tile and concrete cleaning company "Cleaner One" DONATING their time and effort to power wash, color enhance and seal the granite, tile, and concrete of the Flight 93 Memorial in Union City, California. 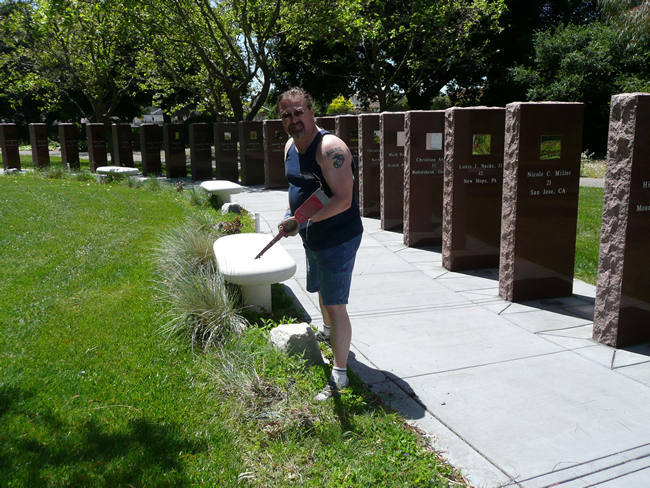 Pictured is Paul Beaton (owner) power washing Mark Bingham's stone name marker. 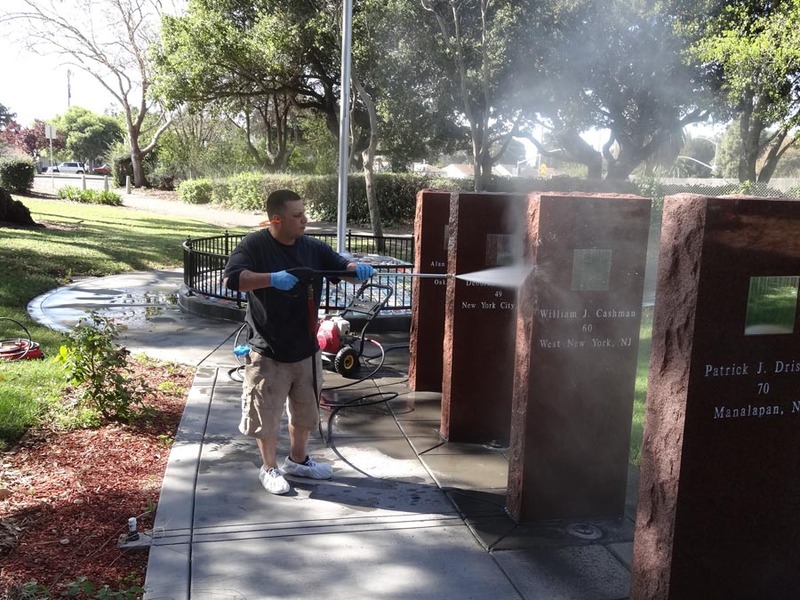 Professional granite, stone, tile and concrete cleaning company "Cleaner One" DONATING their time and effort to power wash, color enhance and seal the granite, tile, and concrete of the Flight 93 Memorial in Union City, California. Pictured is Sean power washing William J. Cashman's stone name marker. 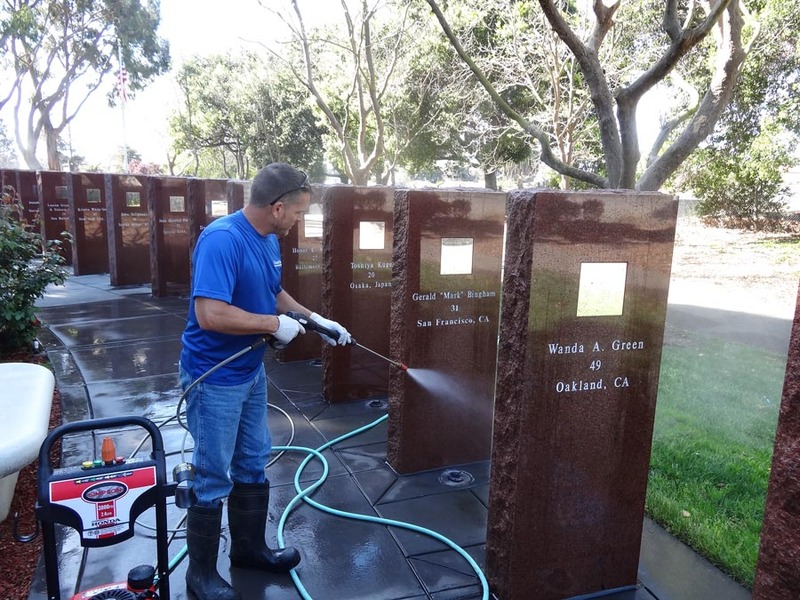 Professional granite, stone, tile and concrete cleaning company "Cleaner One" DONATING their time and effort to power wash, color enhance and seal the granite, tile, and concrete of the Flight 93 Memorial in Union City, California. 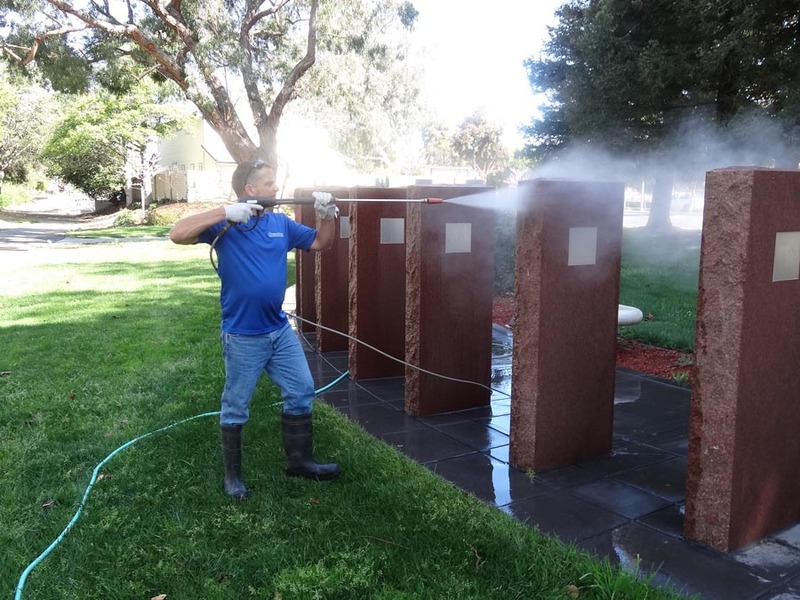 Pictured is Paul Beaton (owner) power washing the back of one of the granite name stones. Copyright © 2005 - 2013 for 93Memorial.com & Flight93MemorialSFB.com. All rights reserved. FAIR USE NOTICE This site contains copyrighted material the use of which has not always been specifically authorized by the copyright owner. We are making this material available to inform and educate, not for financial gain. We believe this constitutes a 'fair use' of any such copyrighted material as provided for in section 107 of the US Copyright Law. If you wish to use copyrighted material from this site for purposes of your own that go beyond 'fair use,' you must obtain permission from the copyright owner.